Someone told me the other day in a text message, “You must really like cars if you’re traveling to see them.” Well, yeah! 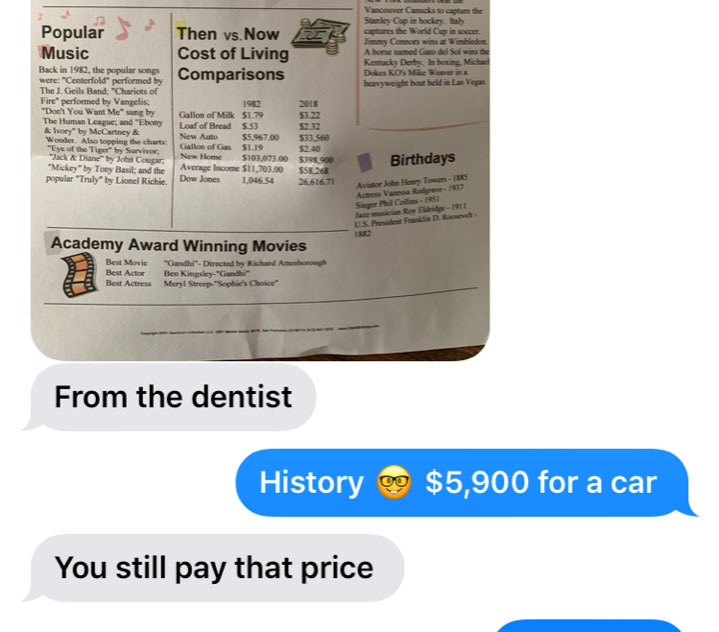 You just can’t attempt to explain an automotive obsession to someone who doesn’t understand it. And that’s okay. 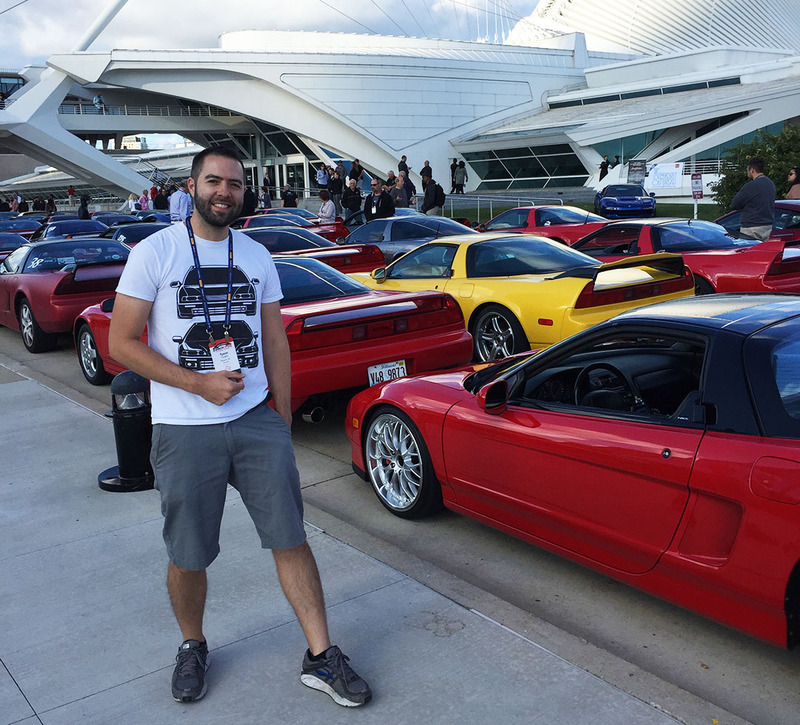 I was a participant a few days ago at this year’s largest gathering of Acura NSX owners in the country, deemed NSXPO and started in the late 1990s. 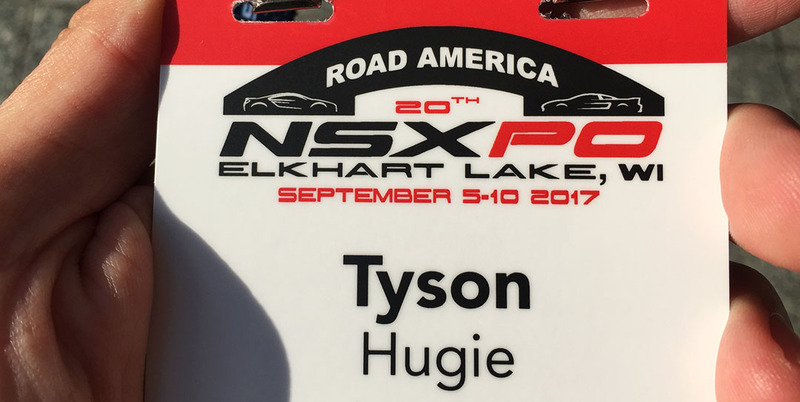 NSXPO is like NALM (the National Acura Legend Meet) but on a much larger (and more expensive) scale. While NALM registration for this year’s Colorado Springs event was $90, NSXPO cost $400 – and neither of those, of course, included other expenses associated with the trip: Fuel, lodging, most meals, and other incidentals. This is a spendy hobby, but I can think of no more rewarding way to invest in a good time. The four core planning committee members definitely had their work cut out for them with a group of this size. 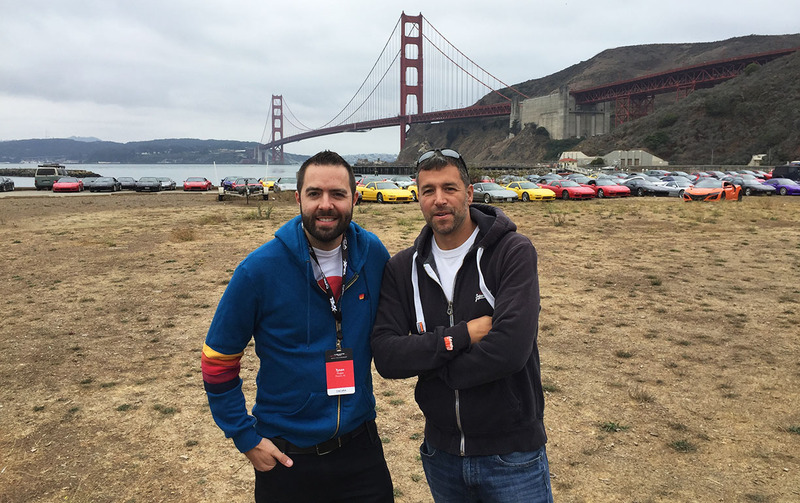 Establishing logistics for an event of any size in the urban San Francisco Bay Area is a feat, let alone with over 230 people and 130 vehicles in attendance. 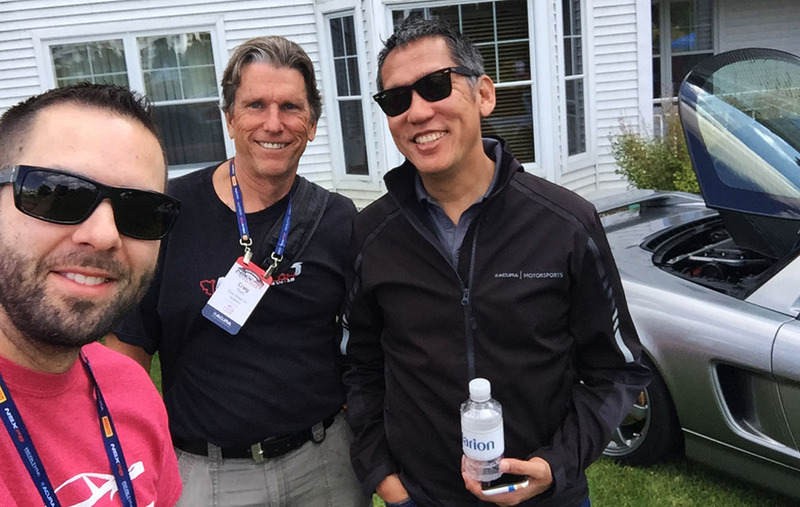 Pictured here are the core team members (May Lee in purple, Roger Estrella and James Ubarro in orange at right, and Les Rowe – not pictured, along with NSXCA President Peter Cunningham, and special guests). 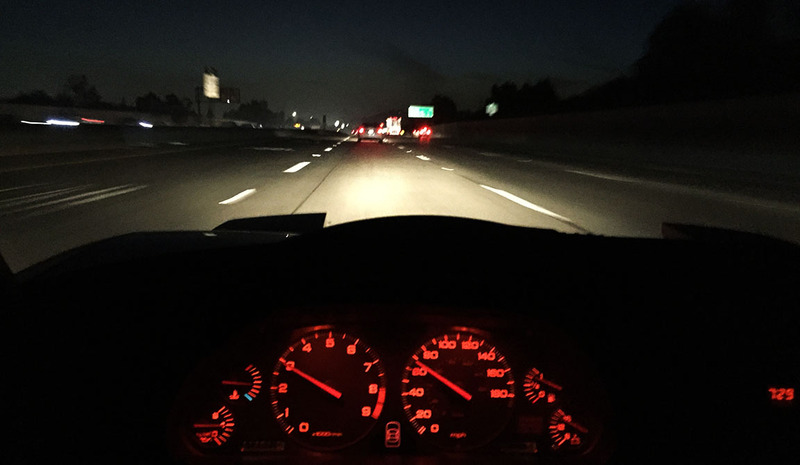 My drive took me through Los Angeles, then upward on Interstate 5 — a road I’ve come to know and love in 2018 thanks to multiple trips: Radwood, my Integra purchase, and then my Integra drive home. 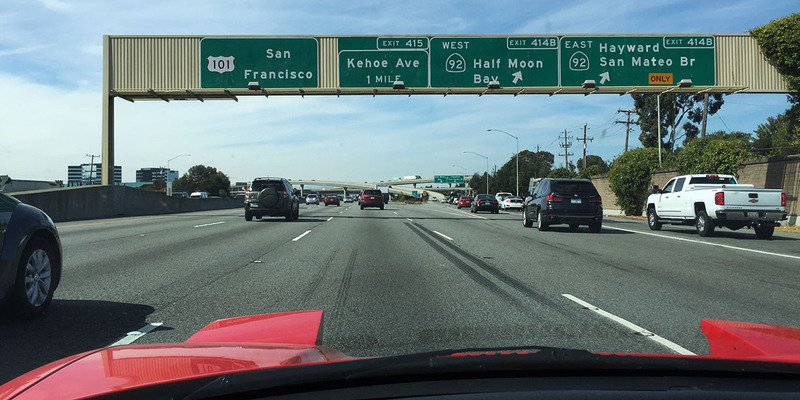 Beyond that, I was also just in the Bay Area for Car Week. 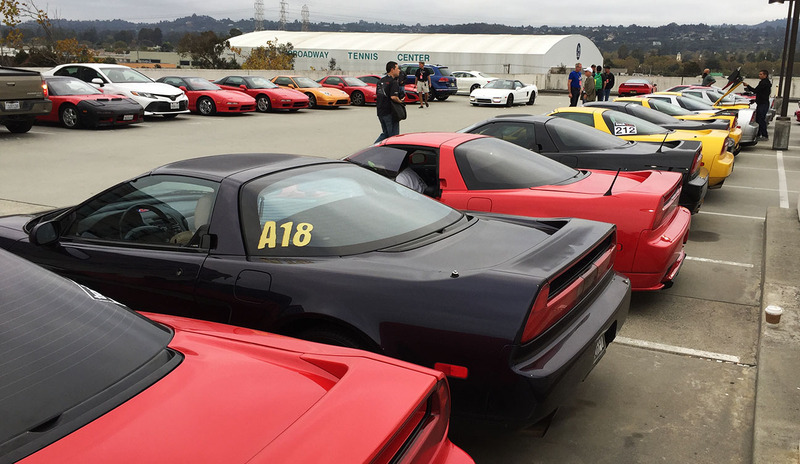 Unfortunately, I missed out on the first two days of this year’s event – the track days at Thunderhill Raceway. Then again, I’ve never been much of a performance driver and I have a lot to learn about pushing my car to its limits before I make a fool of myself! 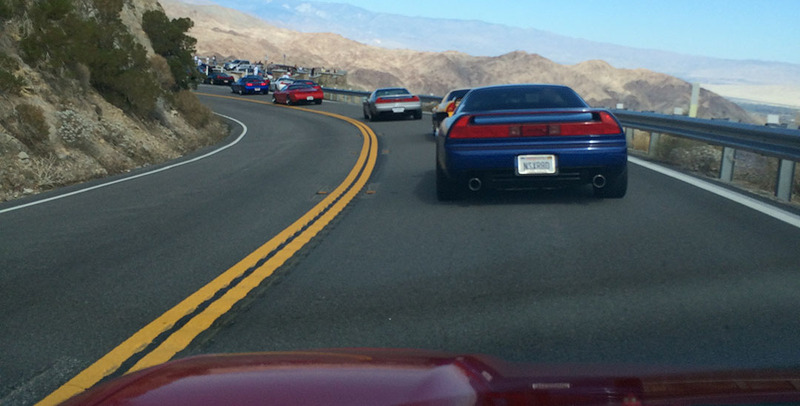 For my own NSX, the trip to California was like going back home. 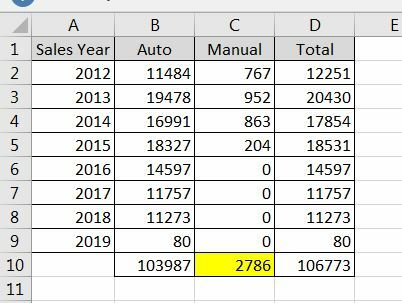 In December 2011, I purchased the car in San Jose. It almost seemed like it was already familiar with the roads out there. 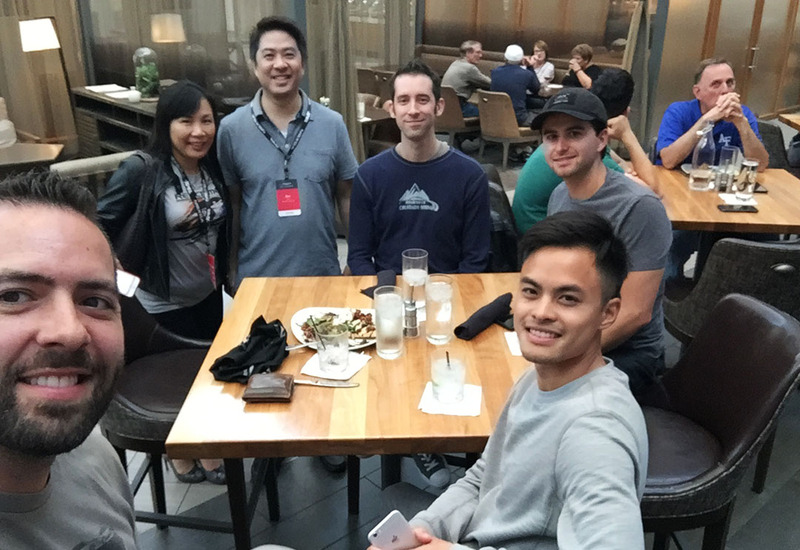 After a roughly 12 hour total travel time, I arrived at our host hotel, the Hyatt Regency SF Airport, on Thursday afternoon and arranged for a few local friends to come over and hang out. We went out in downtown Burlingame that evening in my friend Ken’s 1987 Legend sedan. 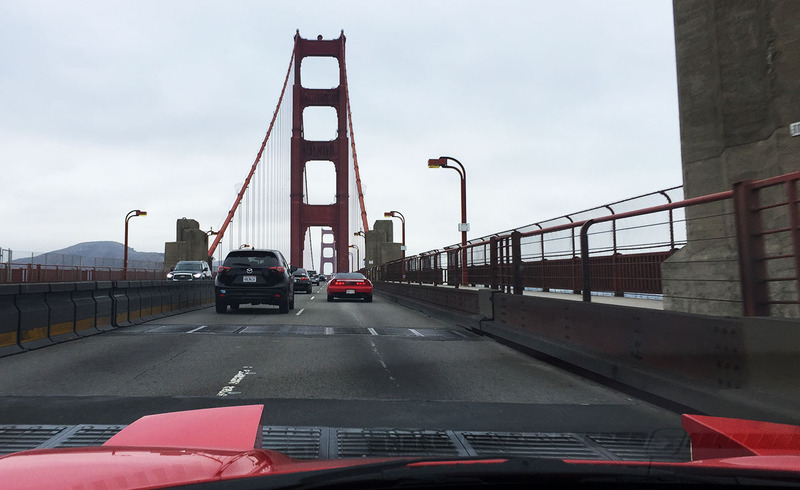 On Friday morning, we braved commute traffic northbound to the Golden Gate Bridge, but it was worth it. 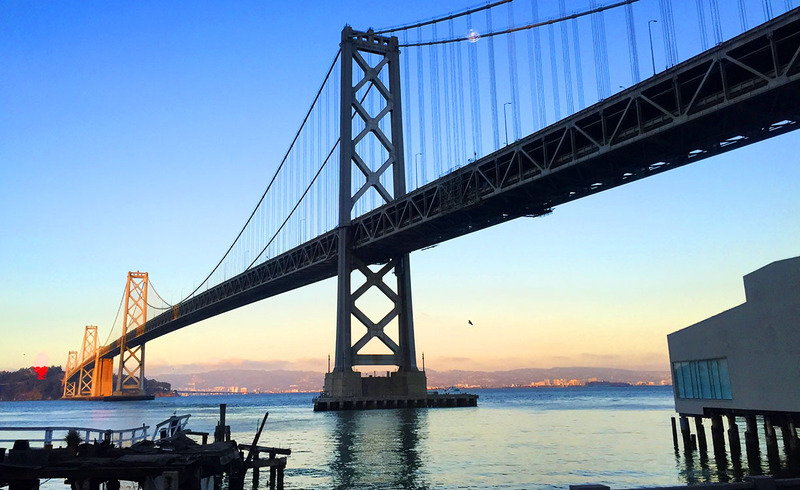 The Golden Gate is perhaps the best-known in the SF Bay Area. When completed in 1937, it was both the longest and the tallest suspension bridge in the world, at 1.7 miles. Today it has a $30 million “zipper” movable barrier system that allows lane usage & direction to alternate. From Horseshoe Bay, we were able to take panoramic photos of all the cars lined up together. 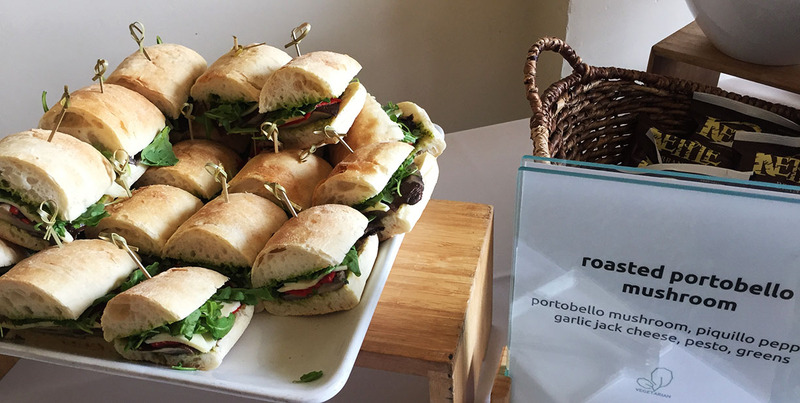 Lunch was served up at the Presidio, with special guest speaker Graham Rahal, who has scored himself some impressive race wins during his career. Graham was the youngest person to win an American open-wheel race, at age 19, which was ten years ago. 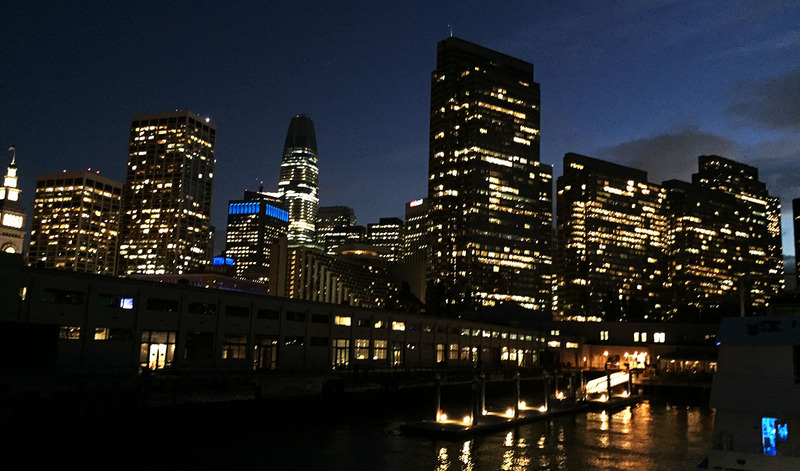 The evening took us out across the harbor from the Embarcadero pier area – a 45 minute bus ride from our Hyatt. As dusk settled in, we were surrounded by stunning views of the illuminated city skyline from out in the water. 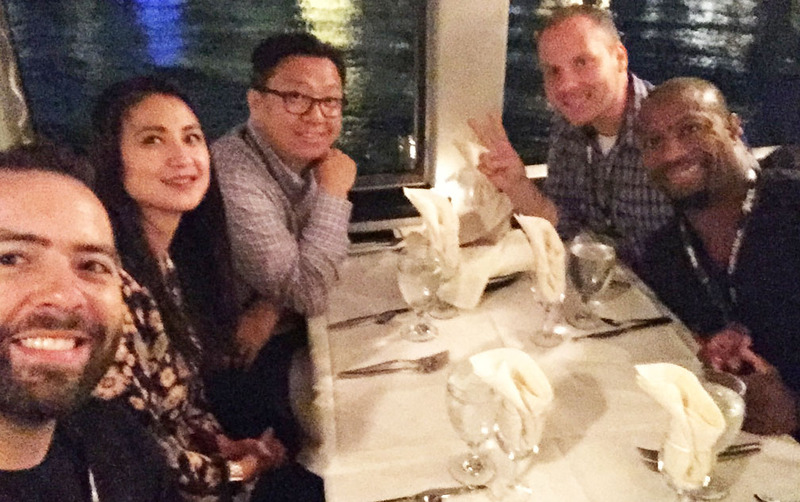 Dinner was served and we had a short program, all while boating along on a massive ship that took us out to the Bay Bridge, around Alcatraz Island, down to the A&T Ballpark where the SF Giants were playing baseball, and then back. The round-trip adventure took about 3 hours, and the highlight was seeing our friend Randy Chua propose to his fiance. (She said yes, which was received with a round of applause). 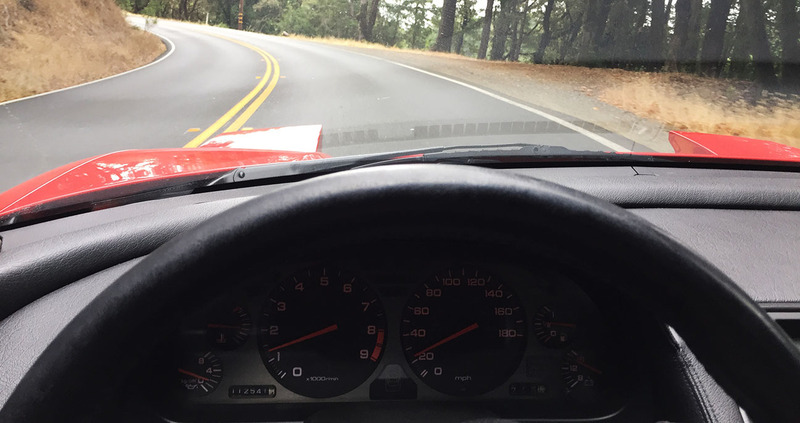 On Saturday, the caravan of NSXs rolled out toward the high elevation community of Woodside, tucked into the mountains about 30 miles south of SF. Mountain Terrace served up a brunch menu there on the grass. 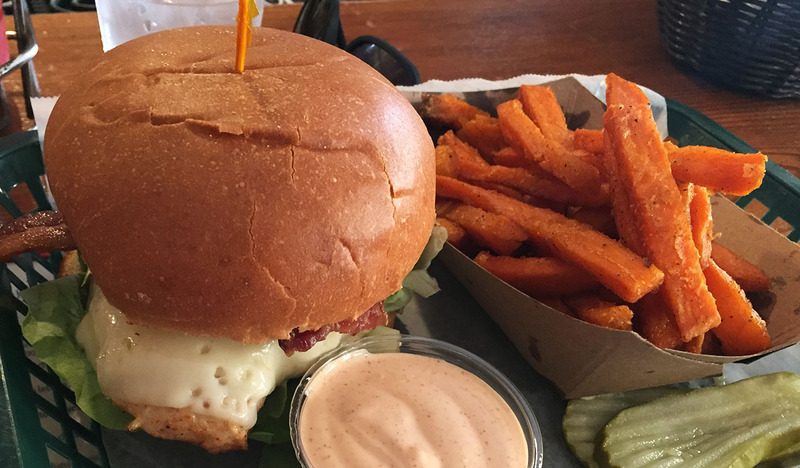 Unfortunately, I had to work that morning and arrived a little too late to join in on that – so I grabbed lunch on my own across the street at a historic spot called Alice’s. 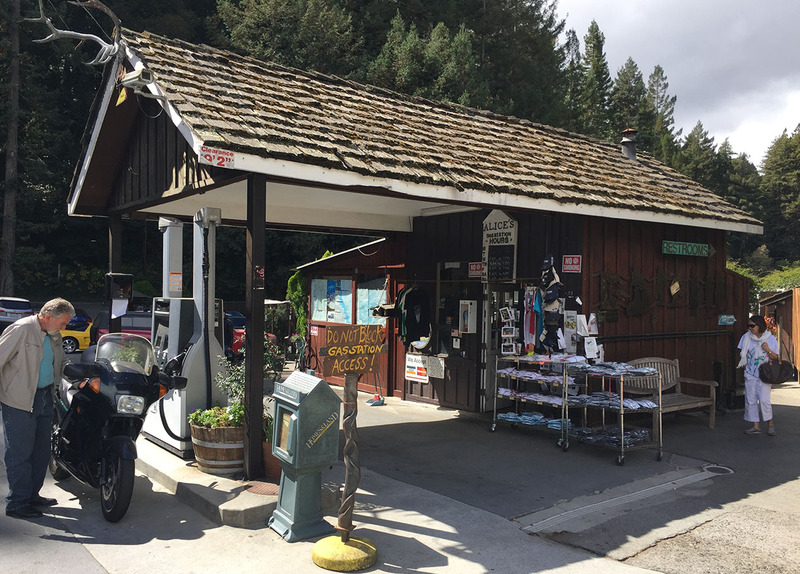 It was originally constructed as a general store, but converted into a restaurant in the 1950s. 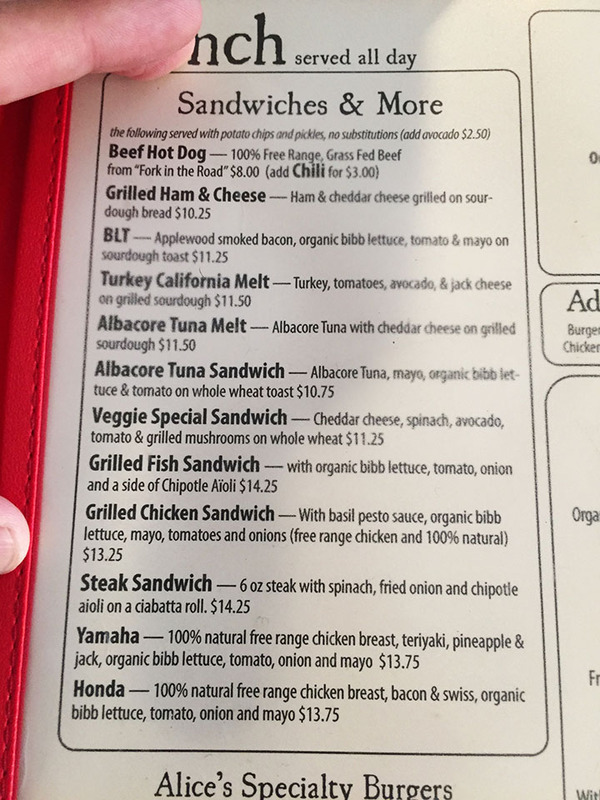 Today it serves a variety of car clubs and motorcyclists year-round, which explains why two of the sandwiches on the menu are the “Yamaha” and the “Honda.” You can guess which one I ordered. 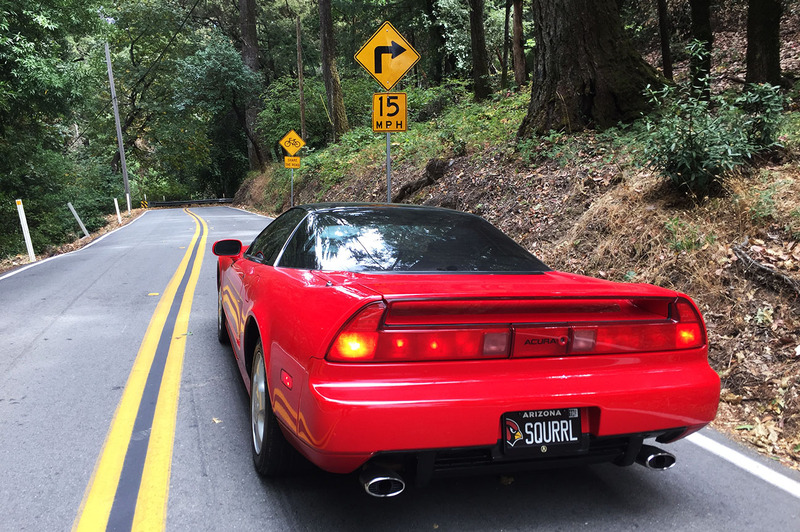 For the next hour, I pointed my NSX southbound on Skyline Drive and enjoyed the twisty roads and the scenery. 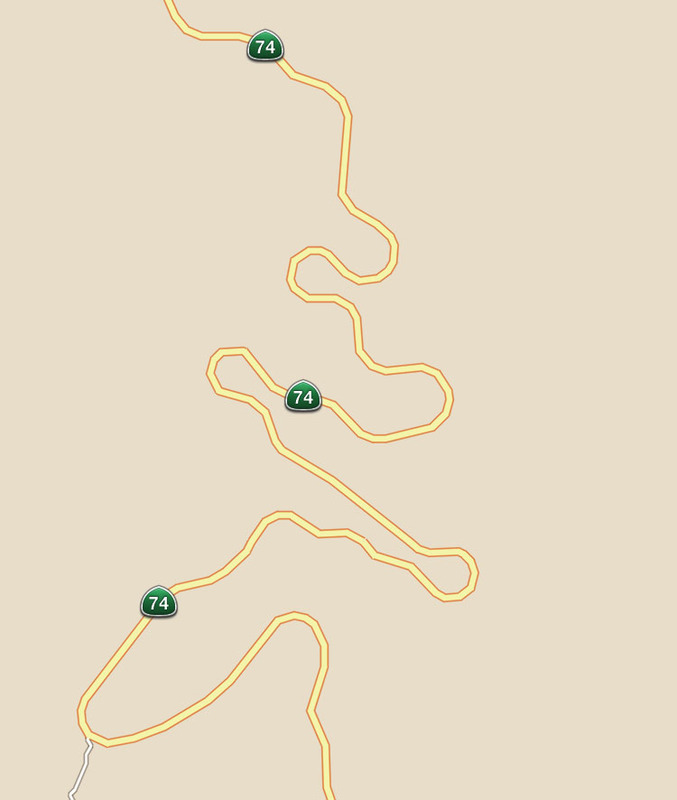 One particularly fun stretch had curves that narrowed to just a single lane of traffic with speed limits at 15 miles per hour. I went a little bit faster than that. 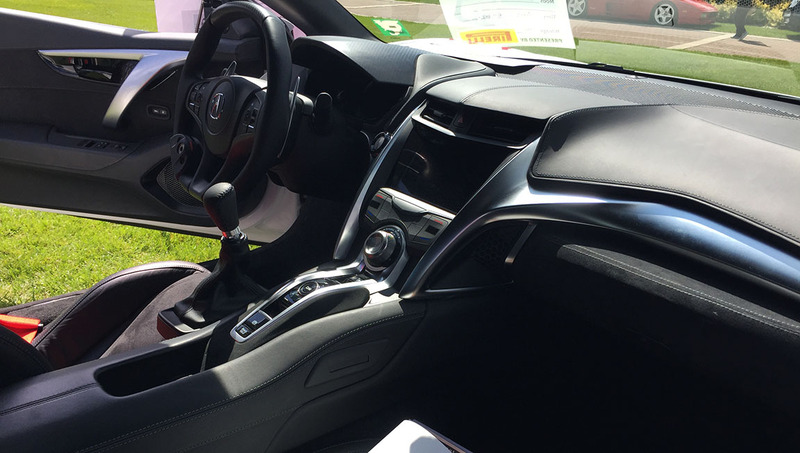 The NSX excels in such a driving environment. 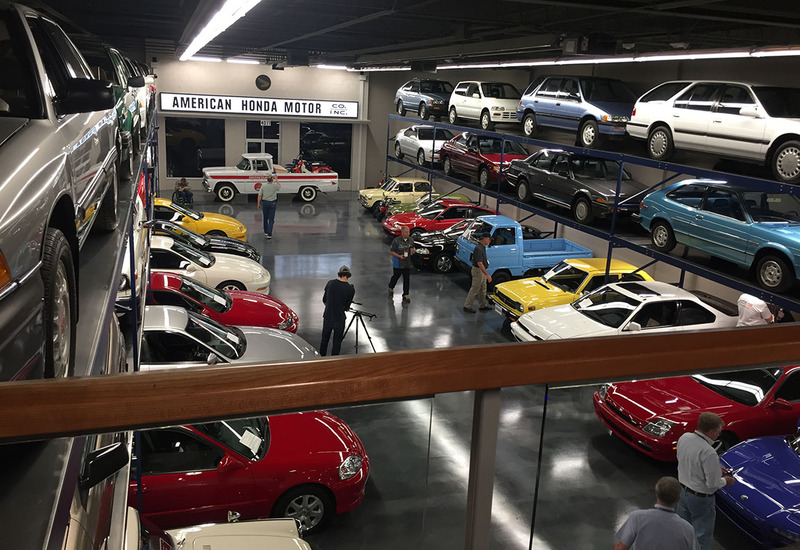 By the time I arrived at our next stop, Canepa Car Museum in Scotts Valley, most of the group had already beat me there. The museum itself also doubles as a dealership, showcasing some of the finest sportscars I’ve laid eyes on. My friend Dom made an appearance back at the Hyatt. 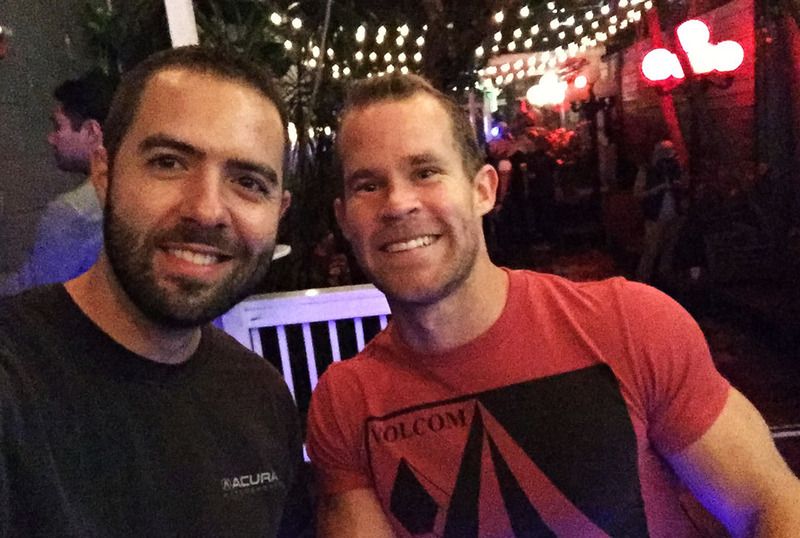 He and I have crossed paths in social media circles for some time now, but this was our first time hanging out in person. 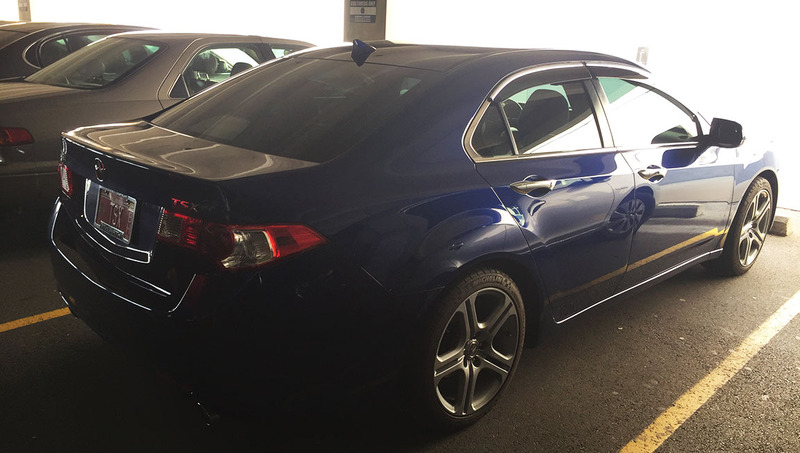 He was in his blue 2013 ILX. 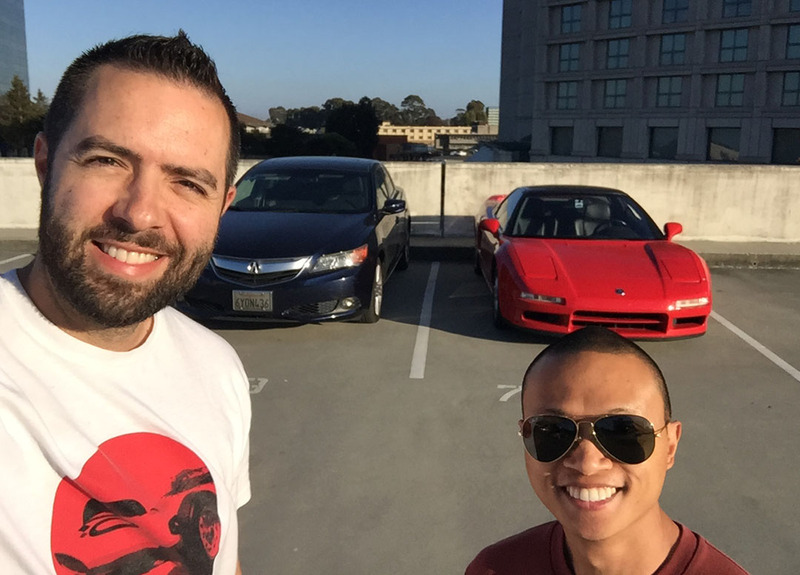 I threw him the keys to the NSX and let him take it for a whirl. We finished our test drives just in time for me to quickly change into more formal clothes and get to the pavilion next to the pool. Seating was already underway for our closing dinner and awards ceremony. 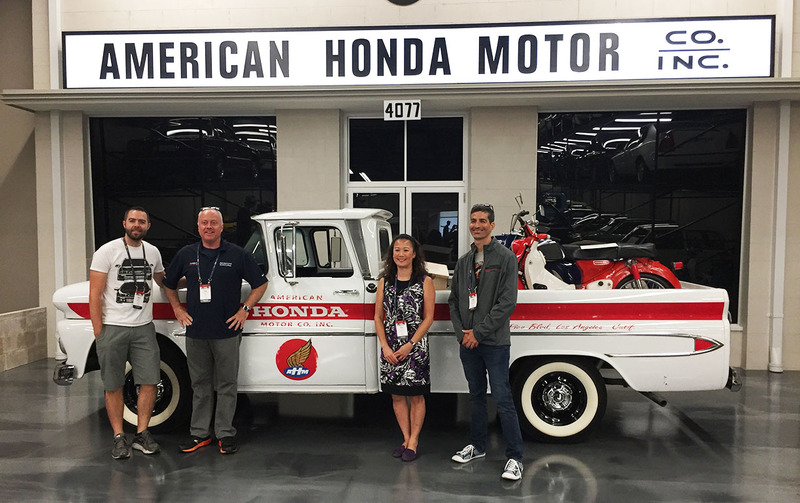 We were honored to hear from Motoharu Kurosawa, otherwise known by the name Gan-San, who had an extensive professional racing career. 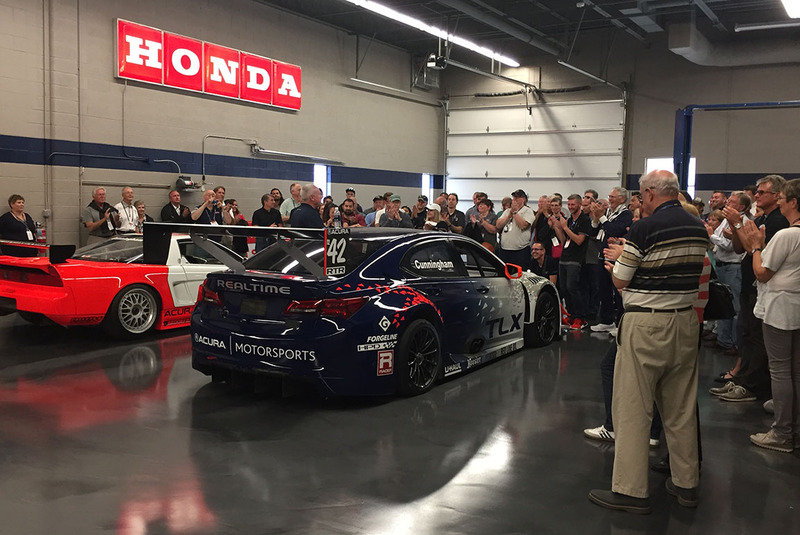 Representatives from HART (Honda of America Racing Team) also addressed the congregation, while dinner was served. 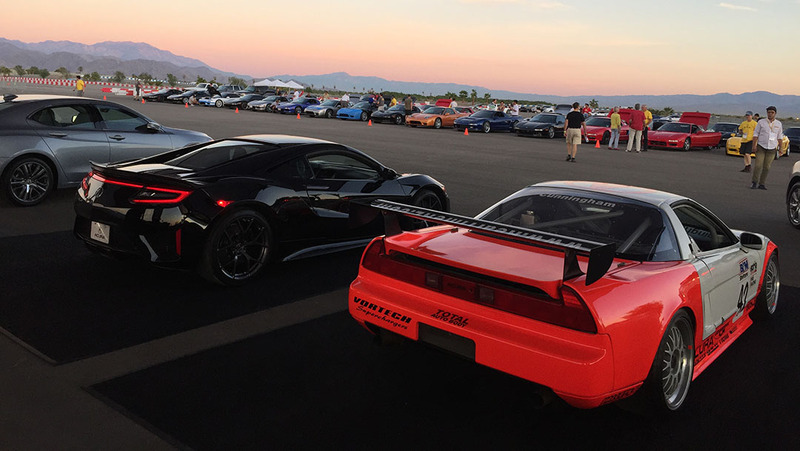 Awards were given out for the best original and best modified NSXs, and the long-awaited announcement was made regarding dates & location for next year’s event. 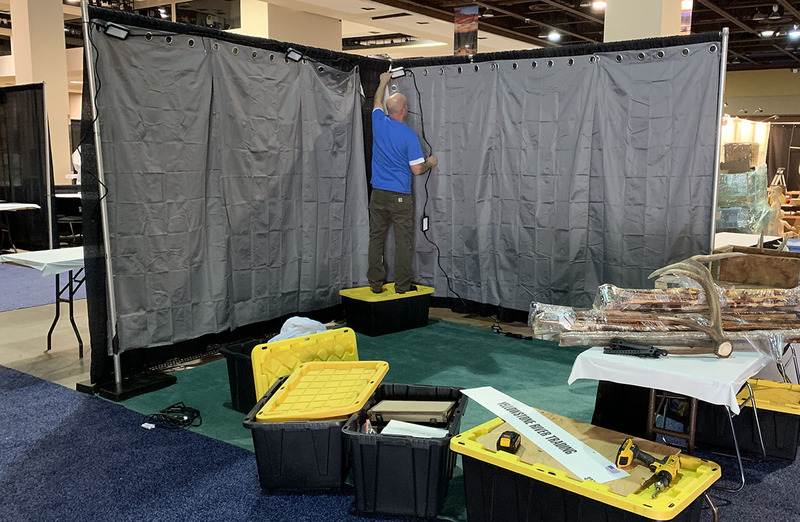 NSXPO 2019 will be held in Washington, DC on October 9-13. All too soon, NSXPO drew to a close and we bid farewell to some of our friends who we only get to interact with once or twice a year. 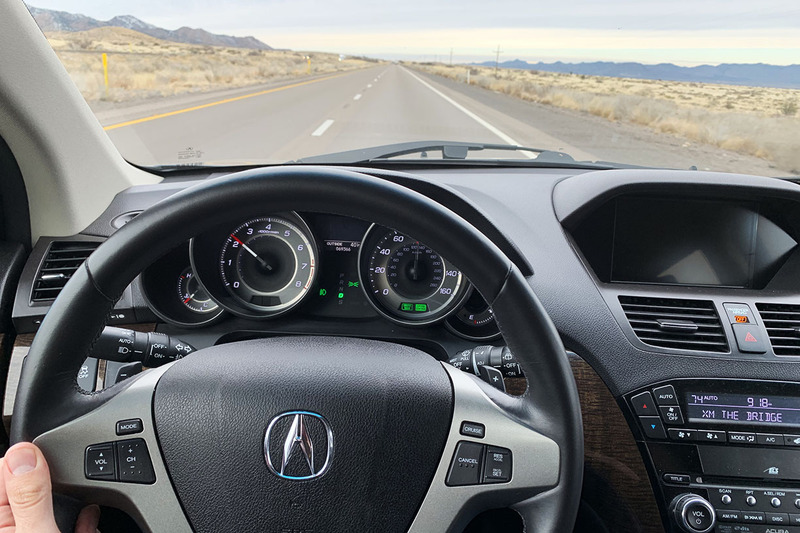 I caught a few hours of shuteye and hit the road early (but not yet bright) on Sunday morning, hauling the entire 11-hour, 800-mile stint with only a few short stops. 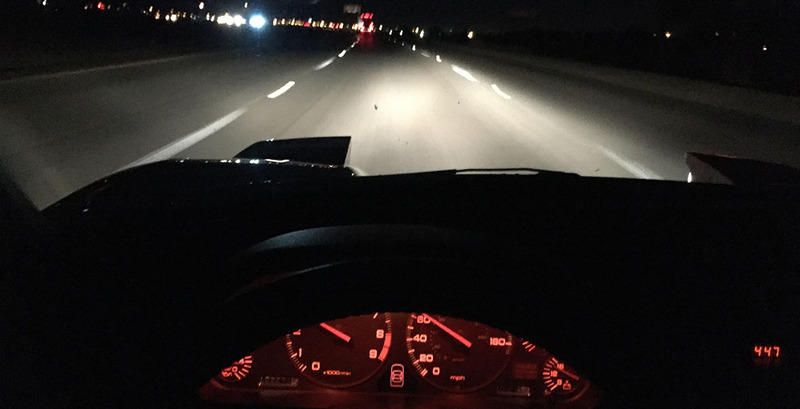 My NSX performed flawlessly and I had plenty of time to jam out to music and enjoy the drive. Looks like this guy’s been to a few meets over the years! 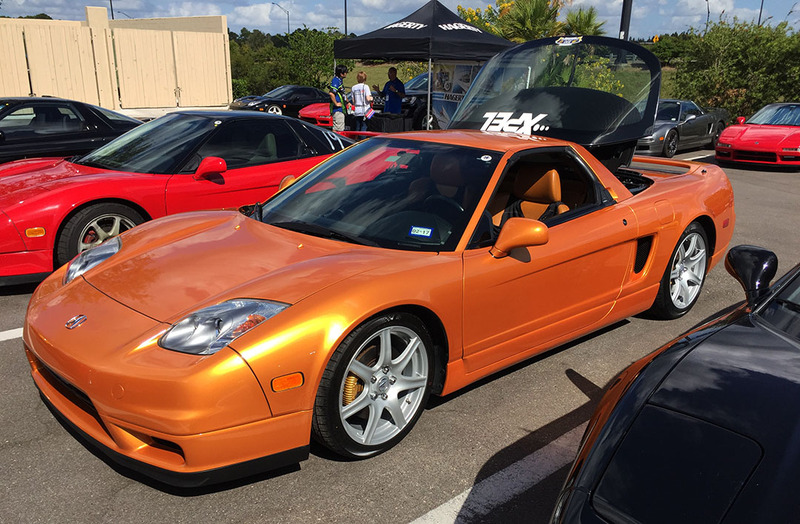 My friend Ben’s 2005 Silverstone NSX-T…. …. 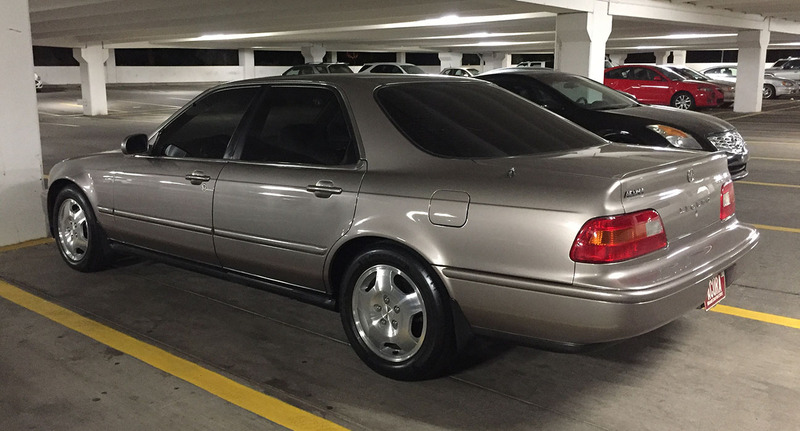 with only 8,300 original miles! 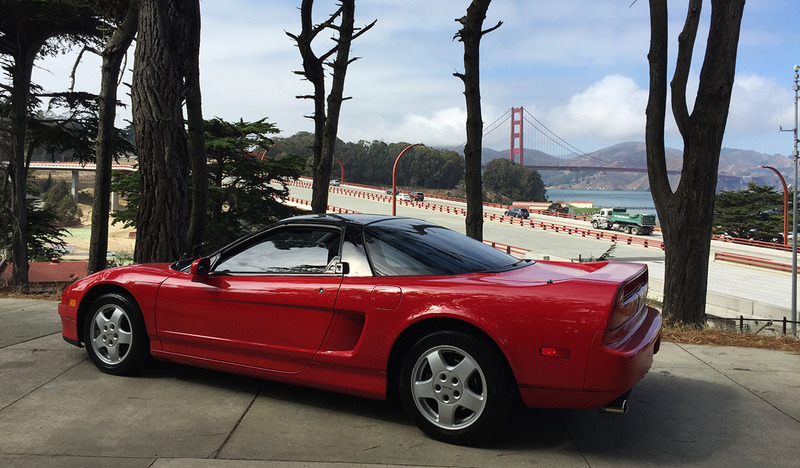 My car with the Golden Gate Bridge in the background. Perfect name for a road! 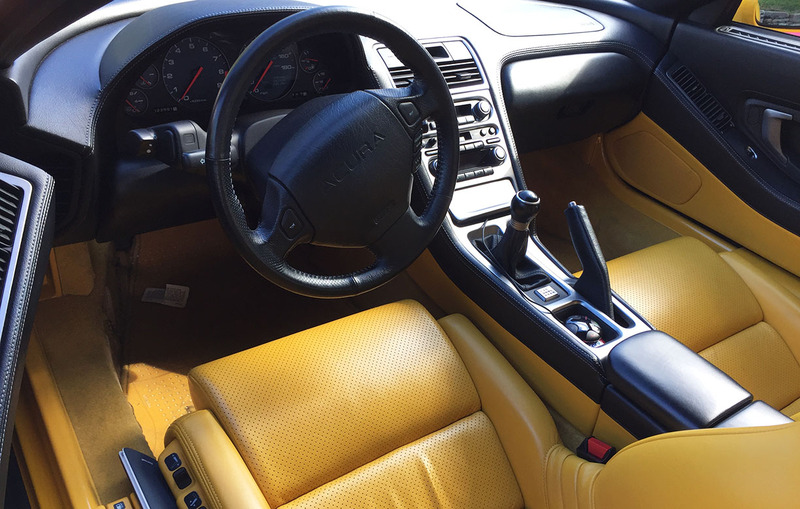 Check out that yellow interior! I had a family reunion this past weekend. My “car club” family, that is. 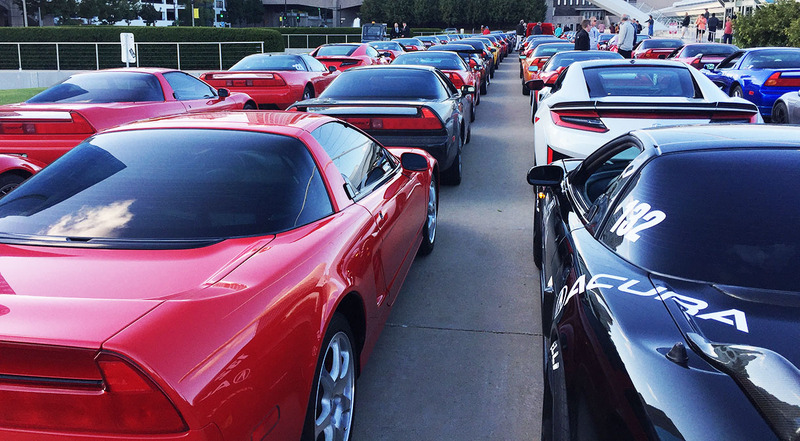 For the third year in a row, I attended the annual gathering of Acura NSX owners & fans called NSXPO. 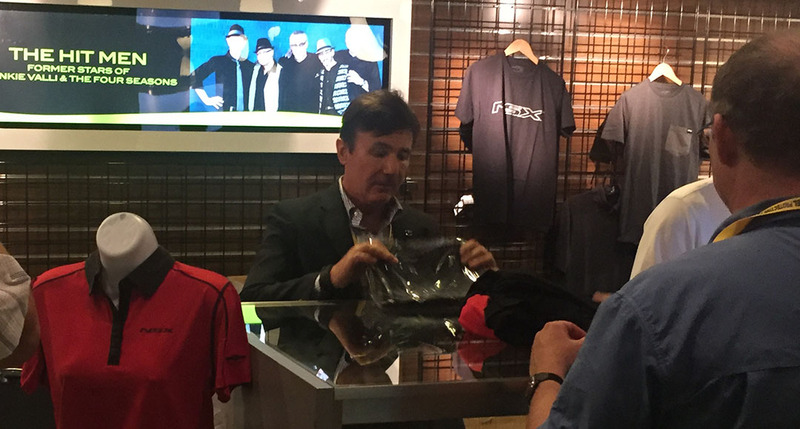 In 2015, the event was in Palm Springs. In 2016, it was in Orlando. And this year, it was in the Milwaukee area. While I would have loved to have driven my car the 1,800 or so miles from Phoenix, I opted rather to take a redeye flight and rent a powder blue Chevy Spark for a few days. It got the job done. 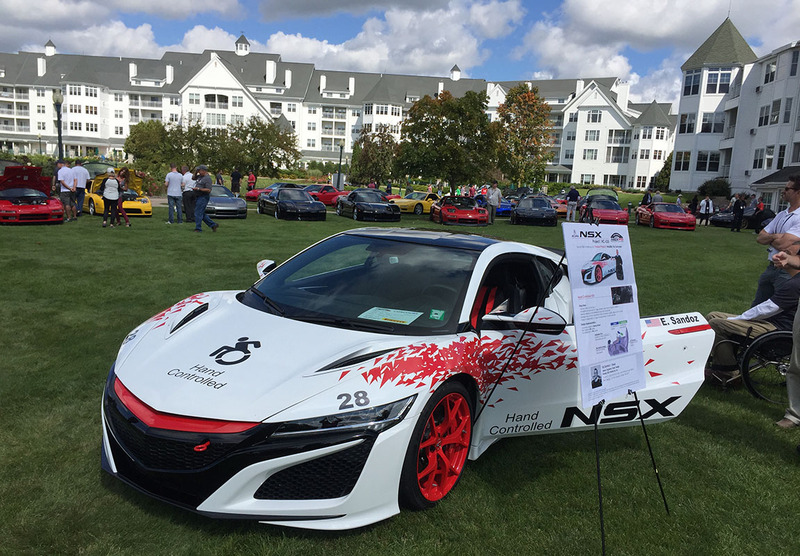 Hosting this year’s event was a team led by RealTime Racing’s Peter Cunningham, a seasoned and highly awarded race driver and the newly-appointed President of the NSX Club of America (NSXCA). 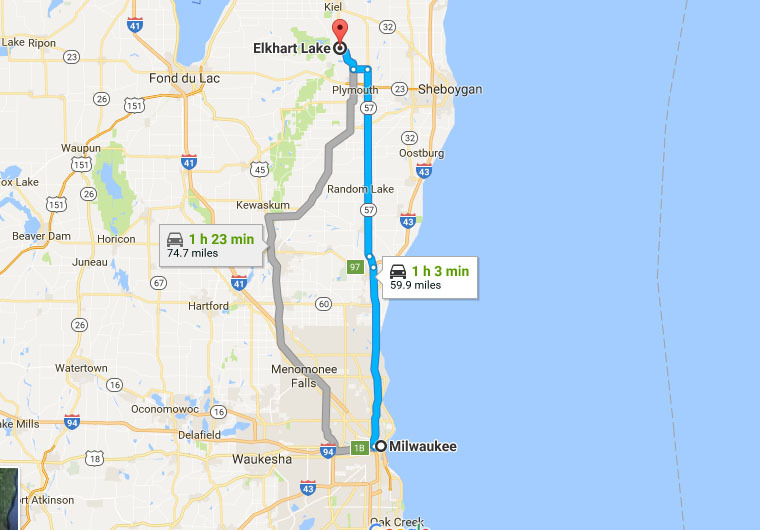 RealTime’s operations have always been based out of Wisconsin, which is convenient since one of the nation’s premier racetracks is located about an hour north of Milwaukee. 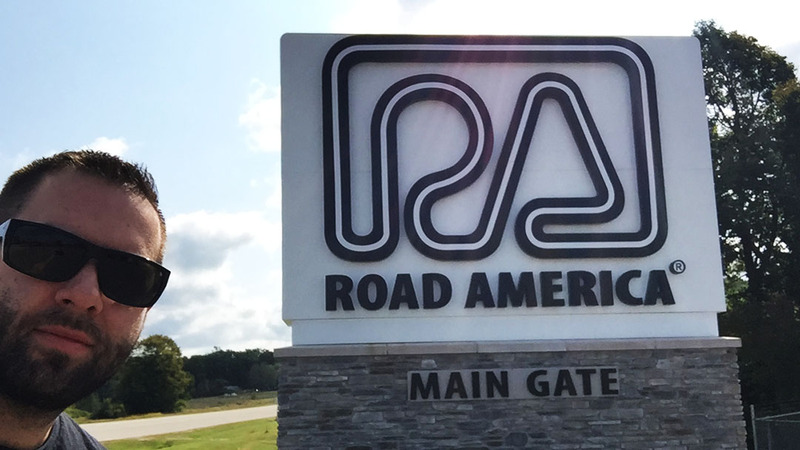 It’s called Road America and goes by the title “America’s National Park of Speed.” Now after 60 years, the 4-mile course is home to over 400 performance driving events annually. 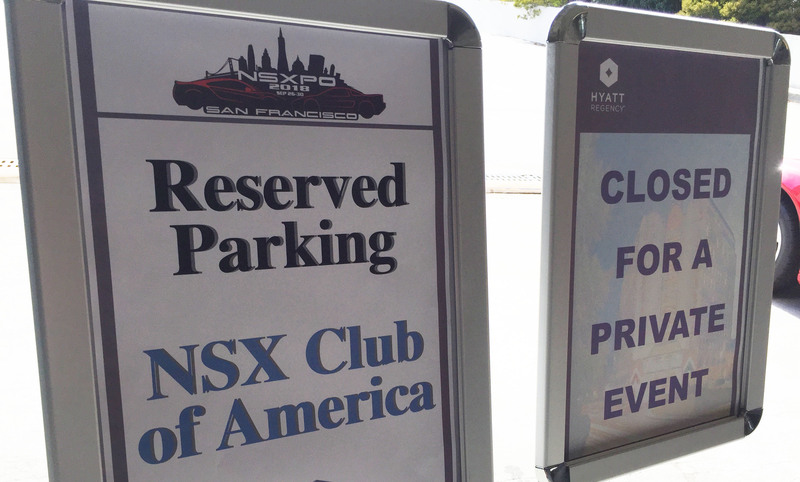 It seems that with each year, the size and scope of NSXPO expand. 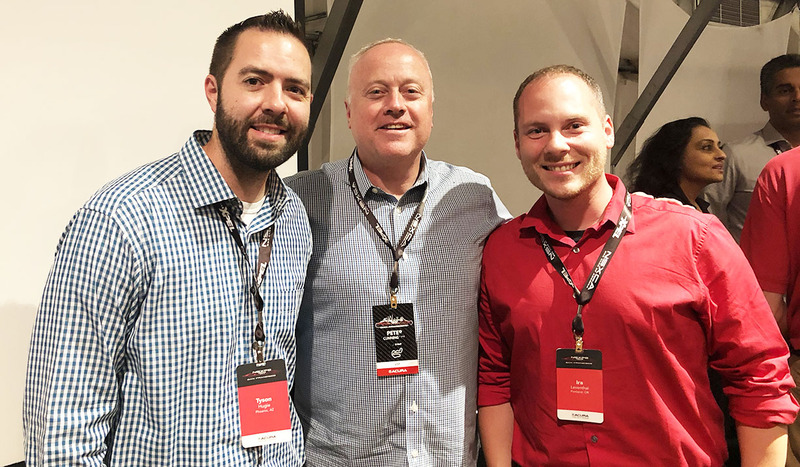 Now covering 4 full days and two half-days, the event drew participants from across the United States as well as internationally. Many drove great distances to attend. Schedule wise, I missed out on the Road America events on Wednesday & Thursday, but made it to some special tours on Friday and the Concours d’ Elegance on Saturday. 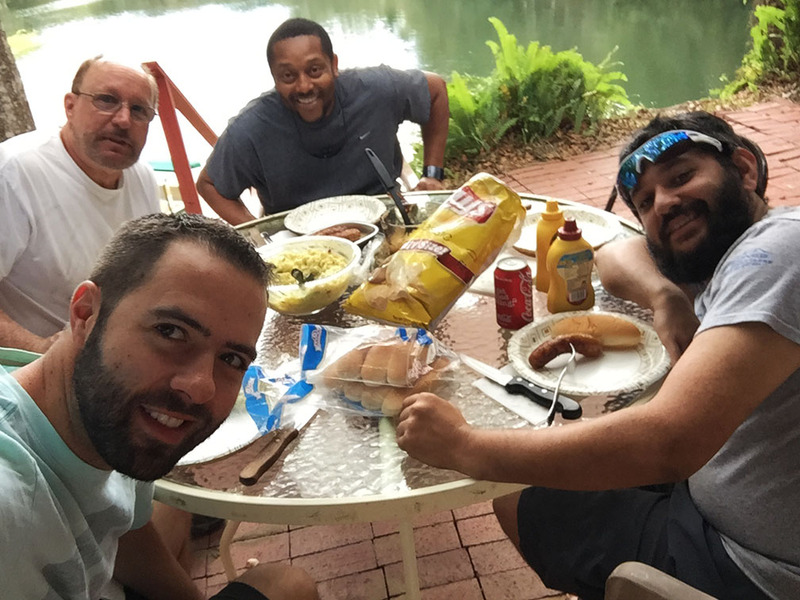 Best of all, I reconnected with over 40 friends, all while enjoying great weather & food. Thanks to a late evening dust storm at Phoenix Sky Harbor airport, my delayed flight to MKE caused me to arrive at the large Osthoff Resort at a pretty crazy hour: 4:04 in the morning. I found the suite I was sharing with my friend Jhae and crashed out for a few hours. 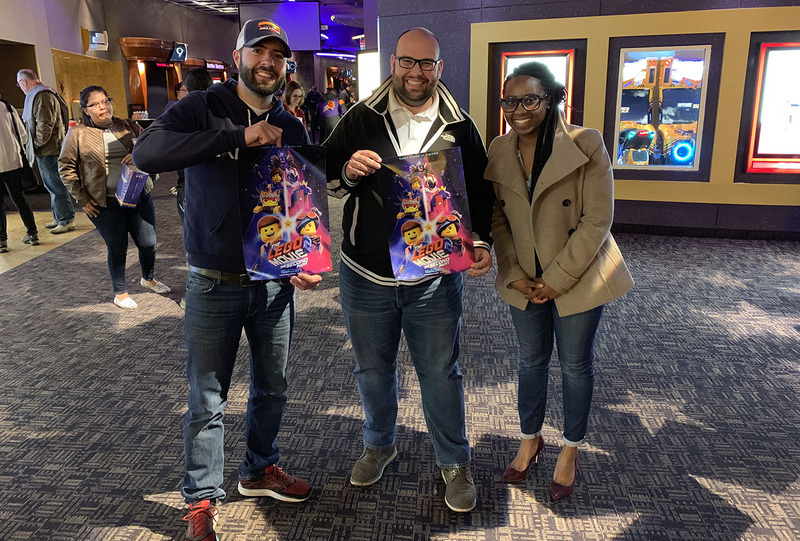 Venues for Friday’s activities were laid out in a logistically favorable order – working our way south with our first stop at RealTime Racing in Saukville. 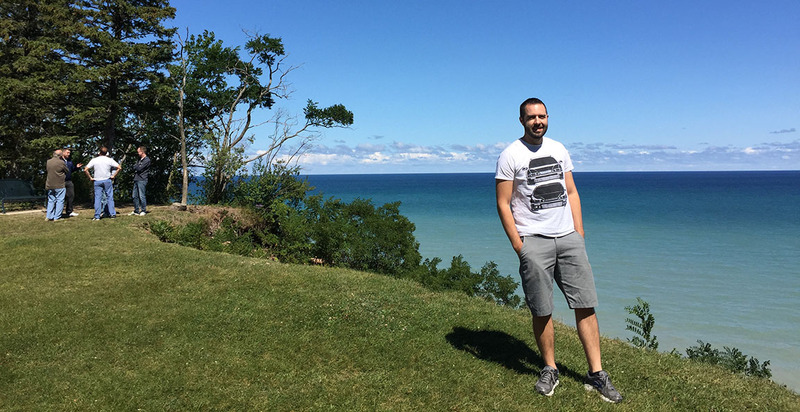 Lunch was picnic-style in the town of Mequon on the western shores of Lake Michigan, a body of water so large it felt like we were perched along the ocean. 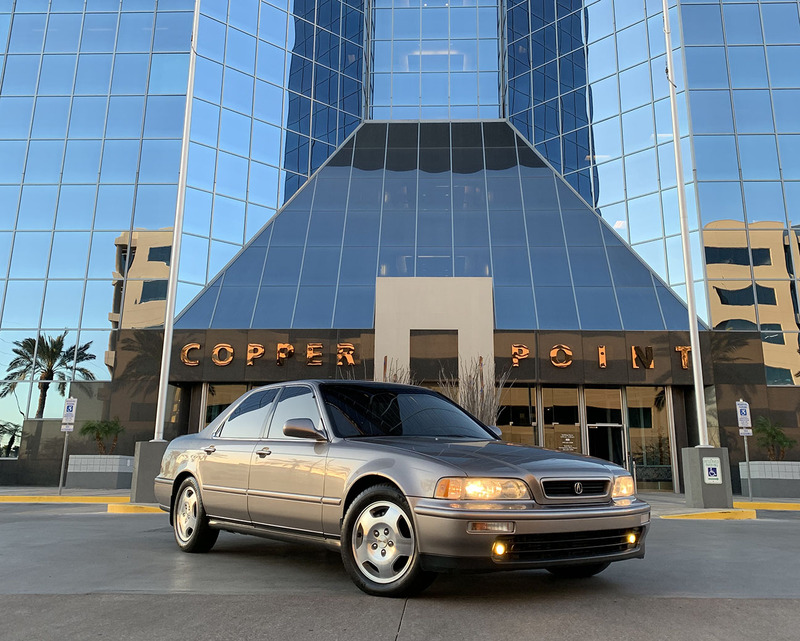 From there, we made our way to the RealTime Collection Hall, established in July 2016 and now extensively stocked in vintage and collectible Honda & Acura automobiles and memorabilia. 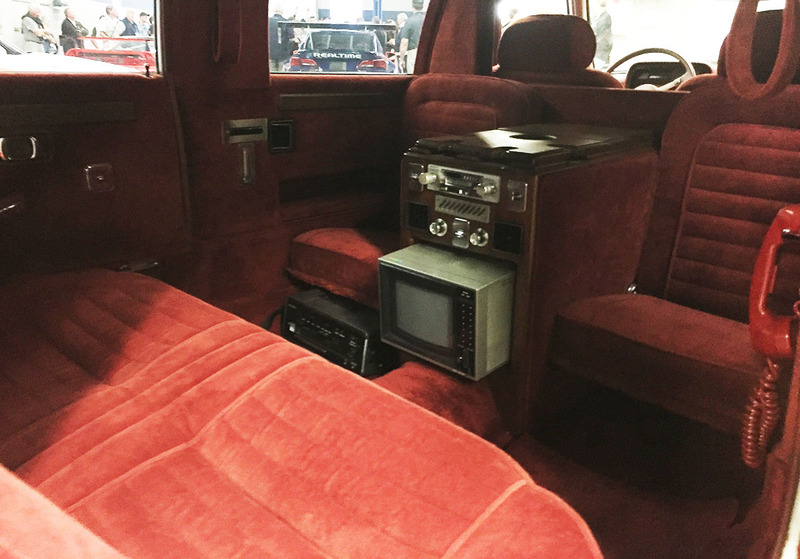 My heart of course is partial to the two Acura Legends in the collection, but perhaps my favorite car now is the 1981 Honda Accord Limousine which was stretched 42″ and comes complete with a Betamax video cassette player and two telephones. 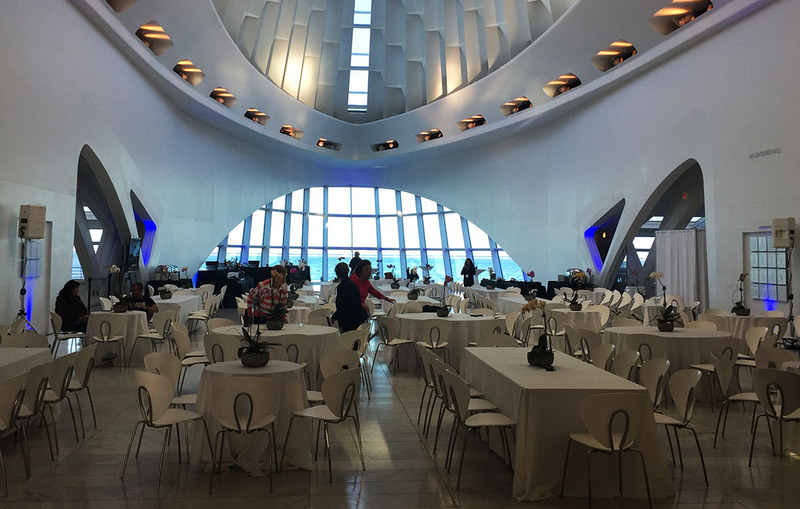 Capping off the night in style and class, we took over the Milwaukee Art Museum (MAM) along the shores of Lake Michigan in downtown. The architecturally distinct and ultra modern building made a picturesque backdrop for the 100+ NSXs lined up along the front driveway. We enjoyed a banquet style feast inside from 5 different food stations while a silent auction was going on. My rental car didn’t even get moved on Saturday, which was nice. 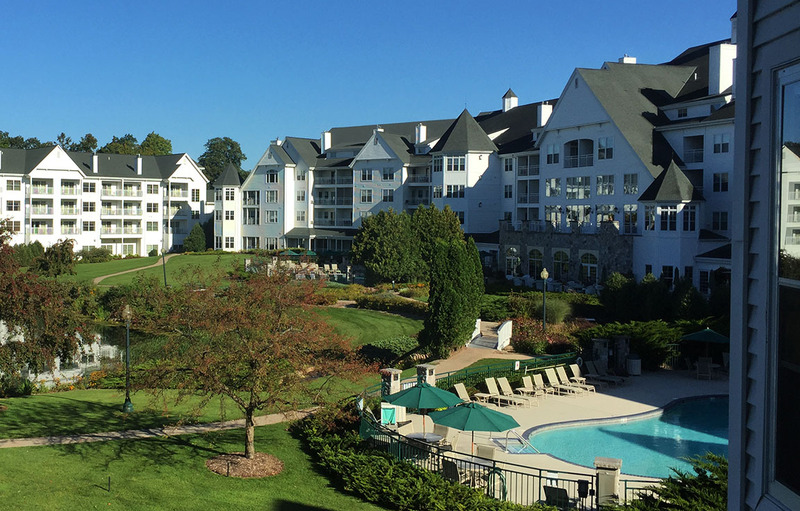 Our activities centered around the Osthoff Resort. 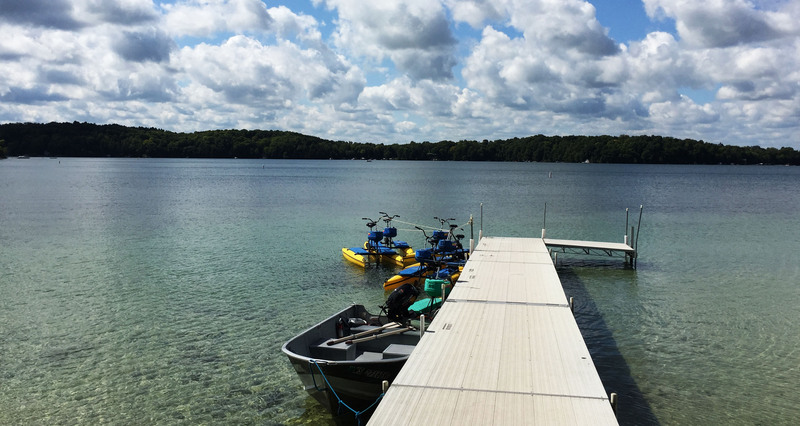 Catching up on sleep from the prior late night, I didn’t creep out of bed until nearly noon – just in time to grab a burger & brat along the banks of Elkhart Lake and wander out onto the dock. 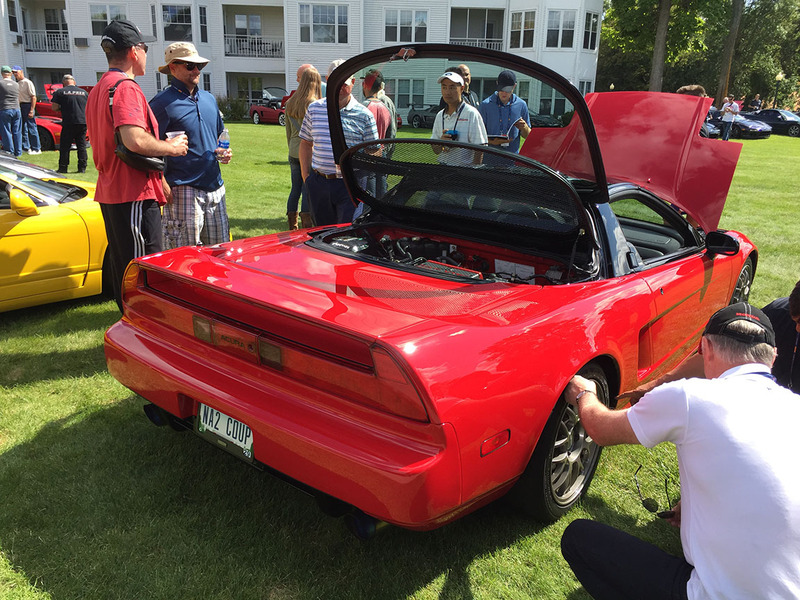 I ran into Acura President Jon Ikeda and Acura NSX Project Leader Ted Klaus while checking out the cars parked on the lawn for the Concours d’ Elegance (Jon is at right here). 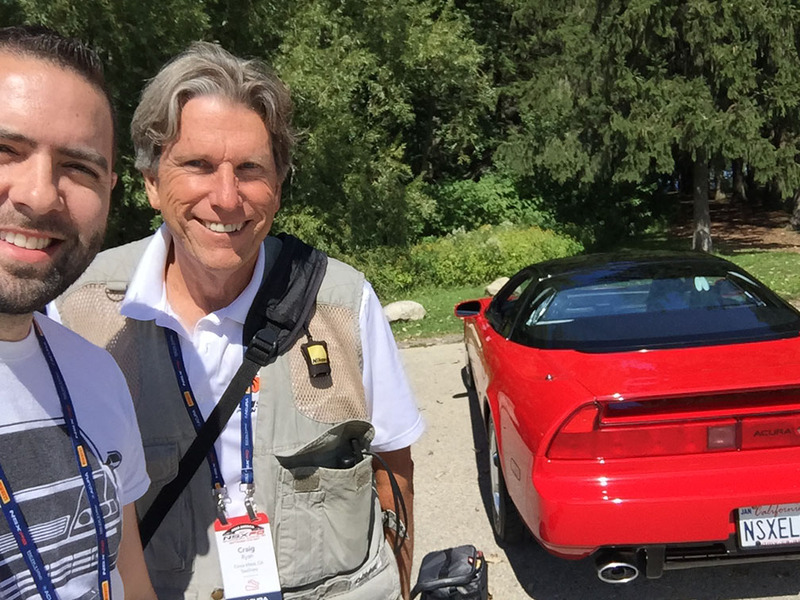 Around 4:00, fellow Arizonan Jhae Pfenning and I helped coordinate a drive around the historic race loop that was once a professional race circuit on public roads before the construction of Road America. Cocktail hour started at 6:00 p.m. in the Grand Libelle Ballroom, and dinner kicked off an hour later. I enjoyed sitting among a few Wisconsin locals at my table. 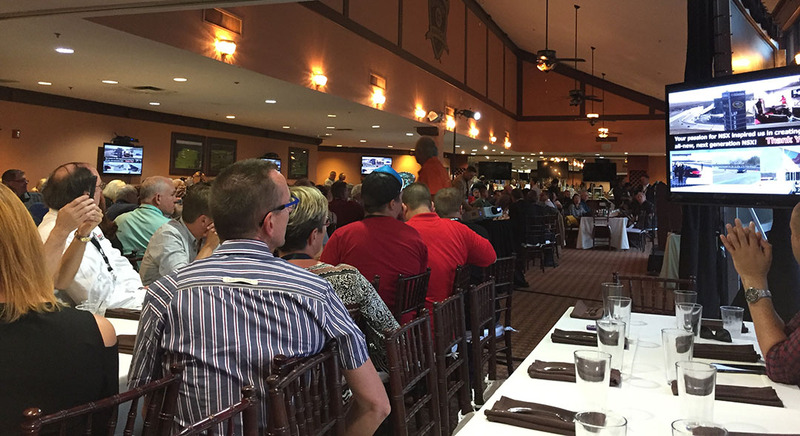 David Hobbs, British race driver and NBC sports commentator, addressed the congregation while we dined. 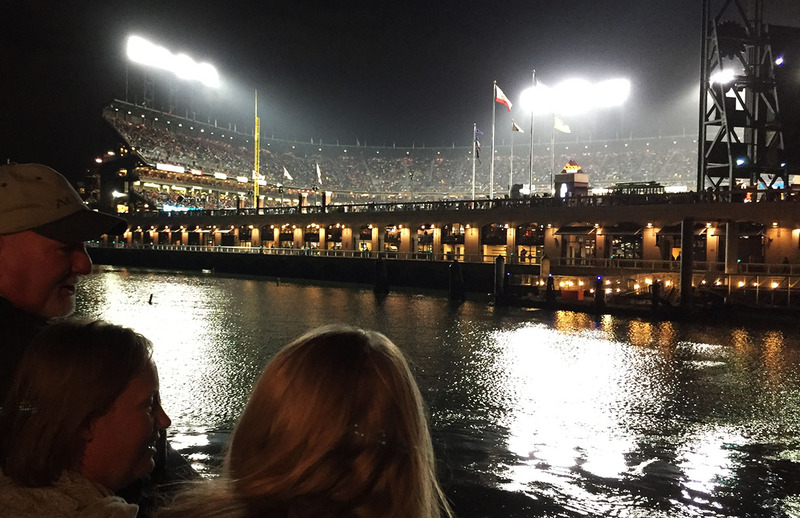 It was announced that the 2018 NSXPO date and location will be September 27 through October 1, in the San Francisco area. My departure day was Sunday, but I squeezed in a visit with a few local friends before hitting the airways. First was my friend Michael who drove his family all the way up from Chicago (about a 2 hr drive) to have lunch with me in Glendale. 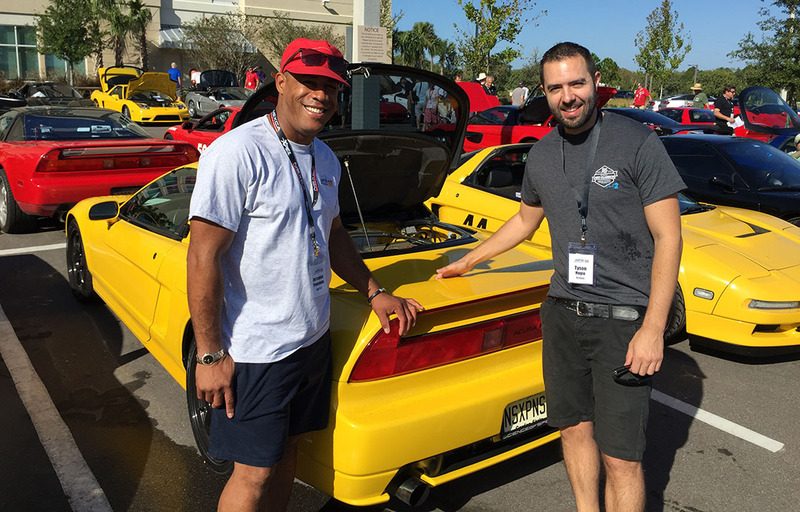 It was great to reconnect with him (and his Vortex Blue TSX). And the next was with Ryan who’s local to Milwaukee and who I’ve known “online” for a couple of years but hadn’t met in person. He brought his red TL out for the occasion. Thanks Mike and Ryan! My 3.5 hour flight home was made shorter by the fact that I was seated next to friend and colleague Chris Willson. 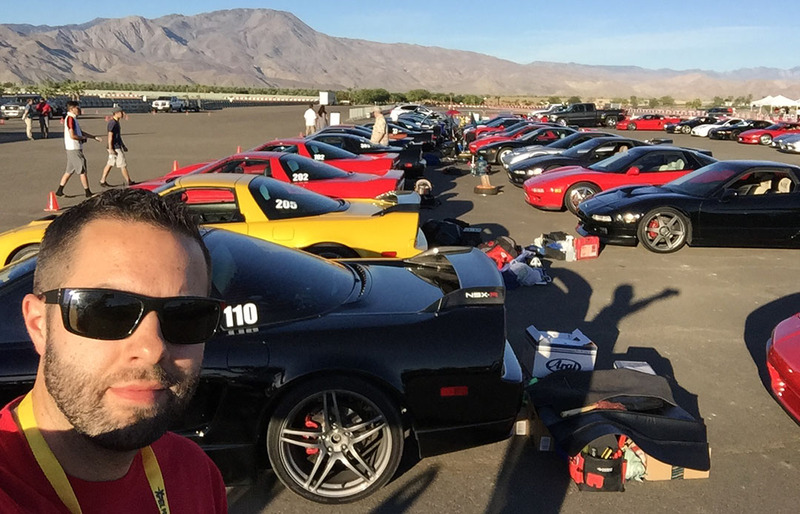 Chris runs a Chandler, Arizona-based NSX & S2000 performance facility called Science of Speed and holds a leadership role as Treasurer with the NSXCA. We touched down in Phoenix around 8:00 p.m. on Sunday to a brisk 100 degrees. Home, sweet (hot), home. A 6-minute video and some additional photos follow! 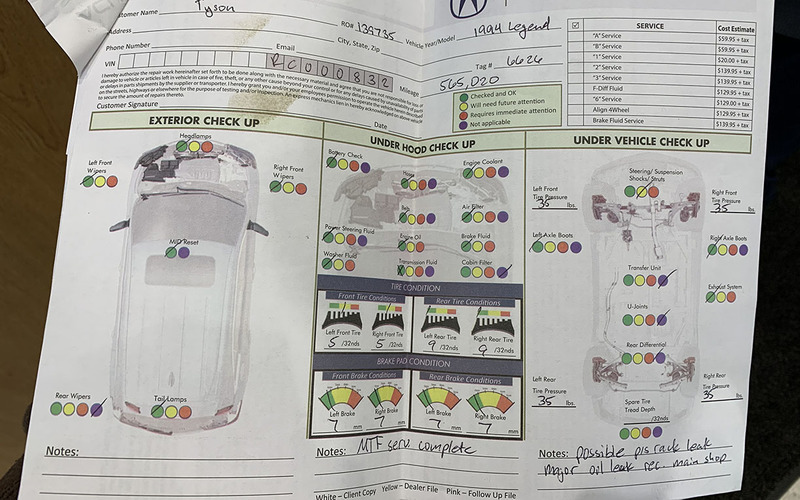 Dashboard of my Chevy Spark LT. I rolled 26,000 on that thing. This was my 2:08 a.m. arrival. I found Waldo! 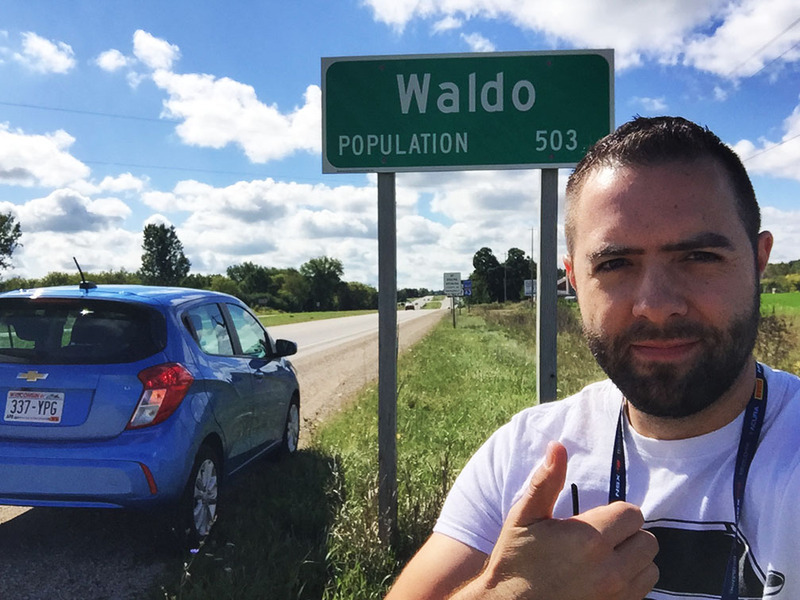 Waldo, Wisconsin that is (population 503). Anybody hungry? 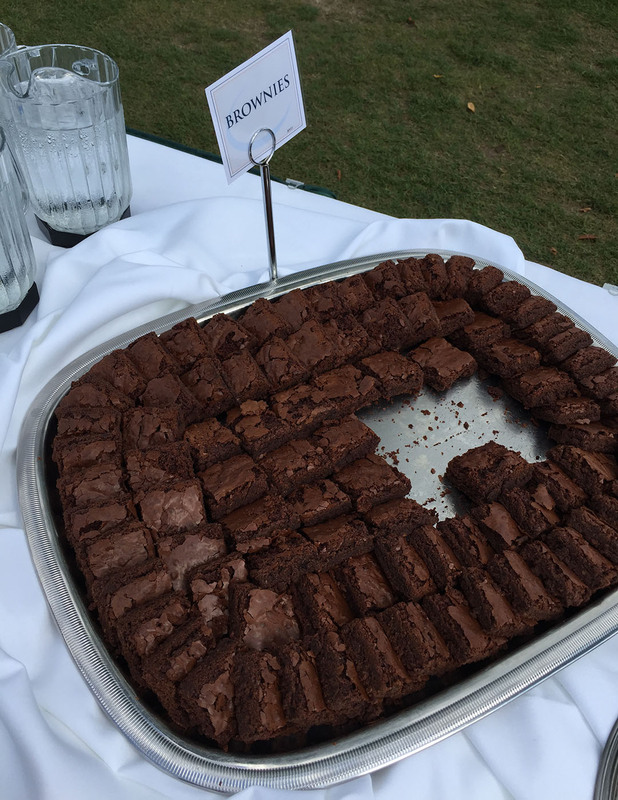 Brownies for lunch. Text from Peter when I dropped him a note thanking him for the hospitality. Today, I’m taking you to Florida. I sadly missed the opportunity to drive 2,140 miles each way from Phoenix to Orlando this past weekend, but it was for the best. 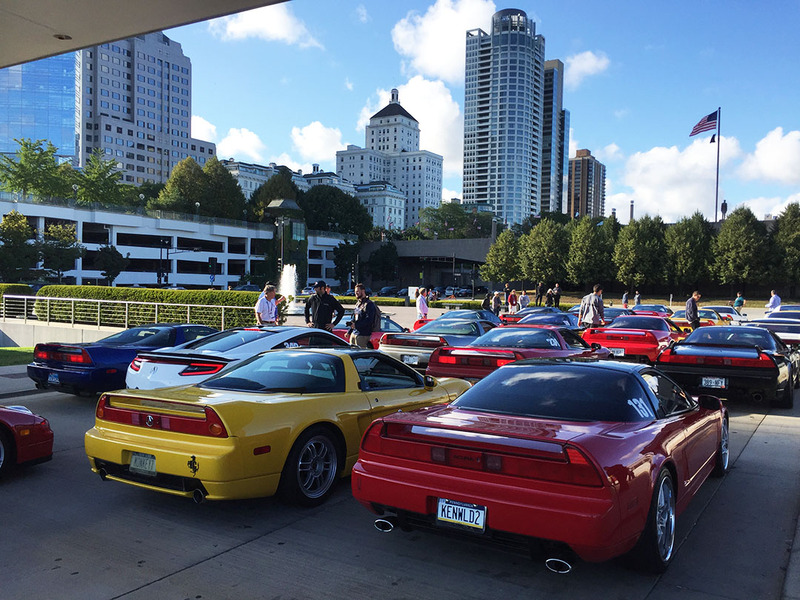 With my new job giving me very limited paid time off, I had no choice but to catch a flight on American and fly the friendly skies to this year’s annual gathering of crazy Acura NSX enthusiasts. It was still very much worth it! 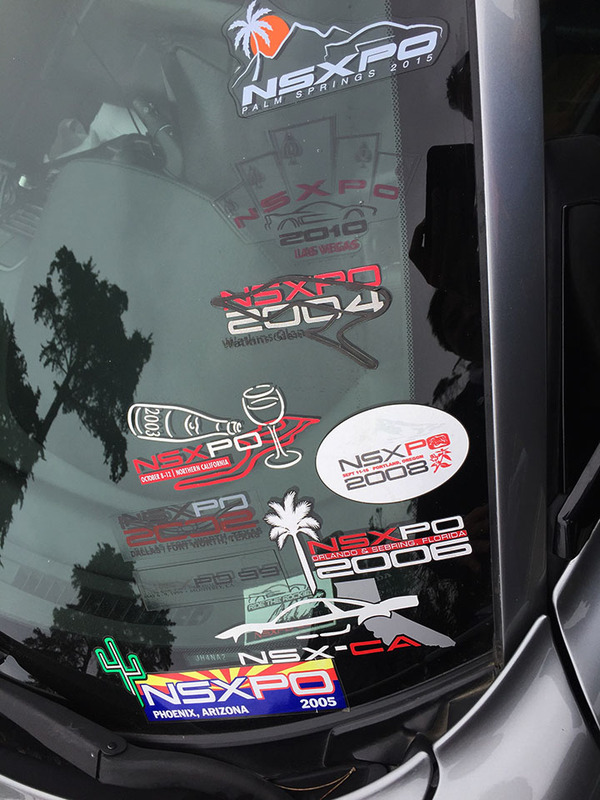 It’s hard to believe that the last NSXPO in Palm Springs is already a year behind us in the rearview mirror. 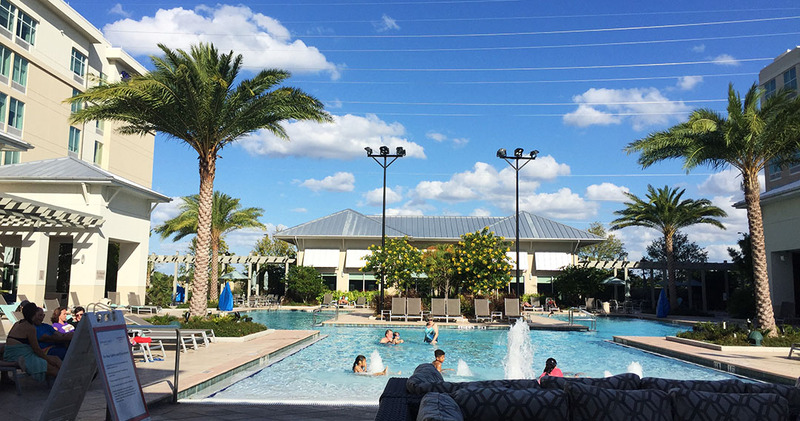 The Orlando planning crew raised that ever-lofty bar even more so: This year’s event has introduced some of the biggest venues and the most organizationally “put together” agenda I’ve ever seen. 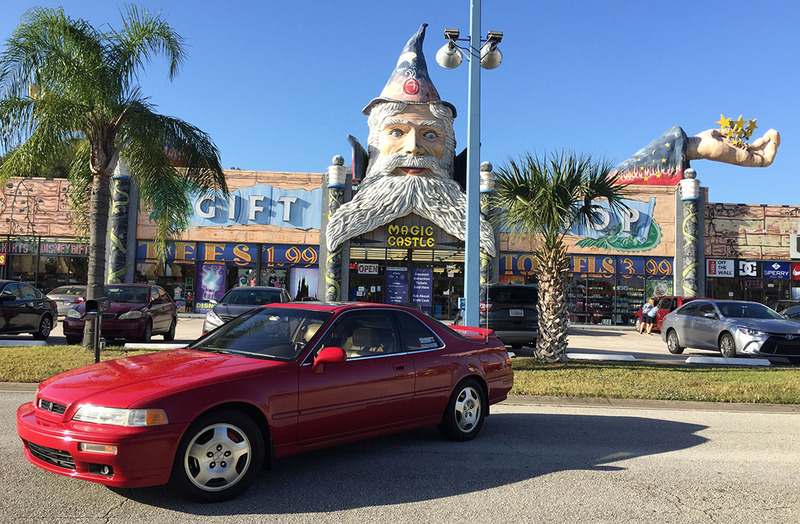 On Thursday, a group of 200-someodd NSXs cruised together to the Kennedy Space Center for a special tour. 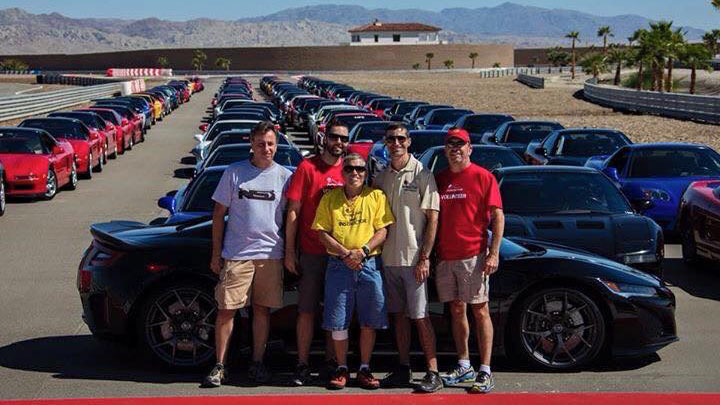 And on Friday, that same group took to the world-renowned Sebring Racetrack for a performance driving event. My Friday evening flight took about 4 hours, but seemed like 7, thanks to the time zones on my west-to-east travels. 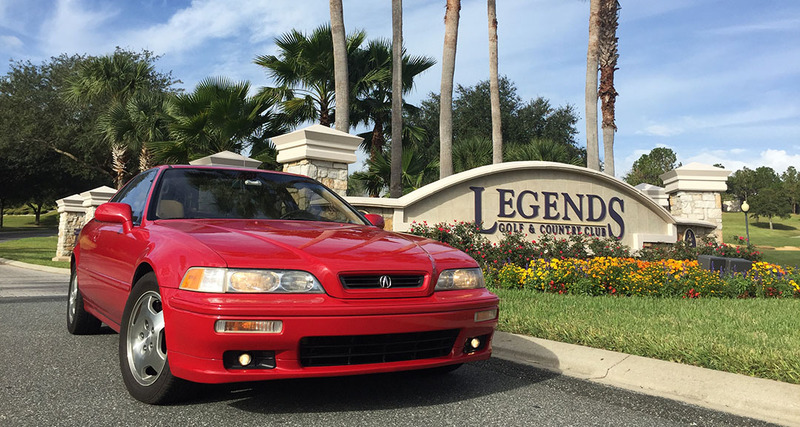 Longtime friend and fellow Legend lover Alan Jackson was kind enough to leave me a “rental” vehicle at the Orlando airport: the 1994 Acura Legend coupe in Milano Red that he’d purchased from my mother back in 2010. 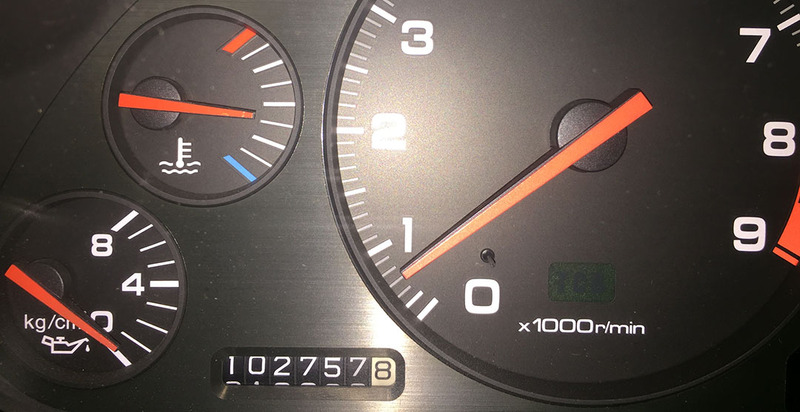 The odometer at crank of the key was just under 170,400 miles and it fired to life like new. Fellow car-nut Brian who’s local to Orlando was kind enough to show me around that evening. 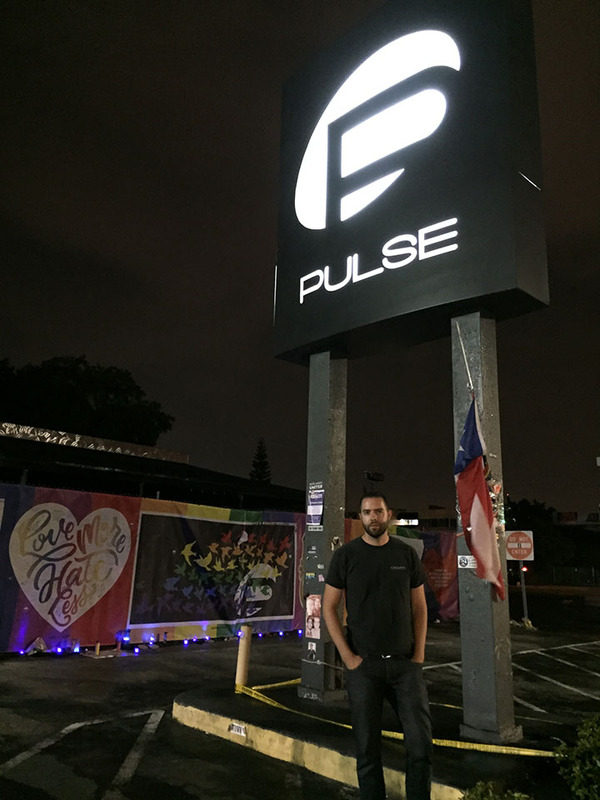 While certainly not a “fun” destination like Disney World nearby, one very important Orlando place in recent news is the Pulse nightclub where dozens of people were killed in June. It happened to be literally around the corner from Brian’s home so I got a photo there while paying my respects. There was a BBQ between 11:00 and 1:00 in the parking lot. 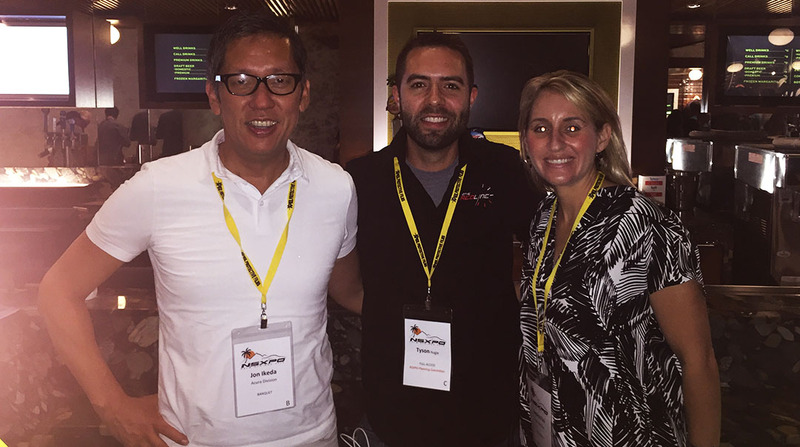 I attended a panel discussion in one of the conference rooms and learned some very insightful information. 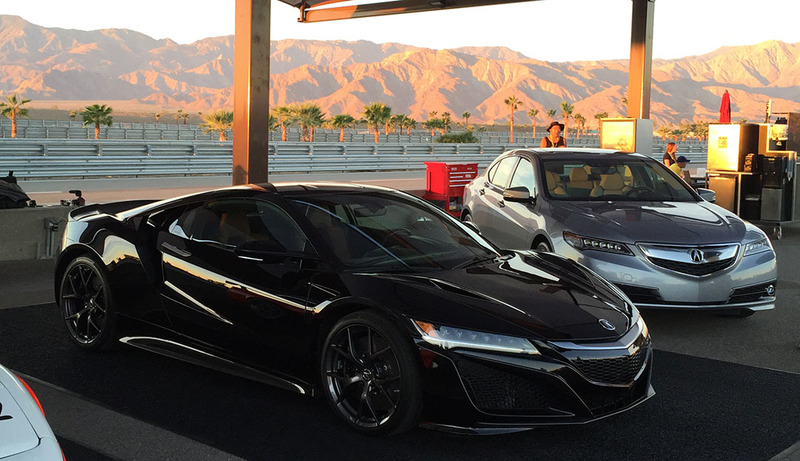 Among the participants was Chris Willson, owner of Science of Speed, an NSX performance shop located in Chandler, Arizona. 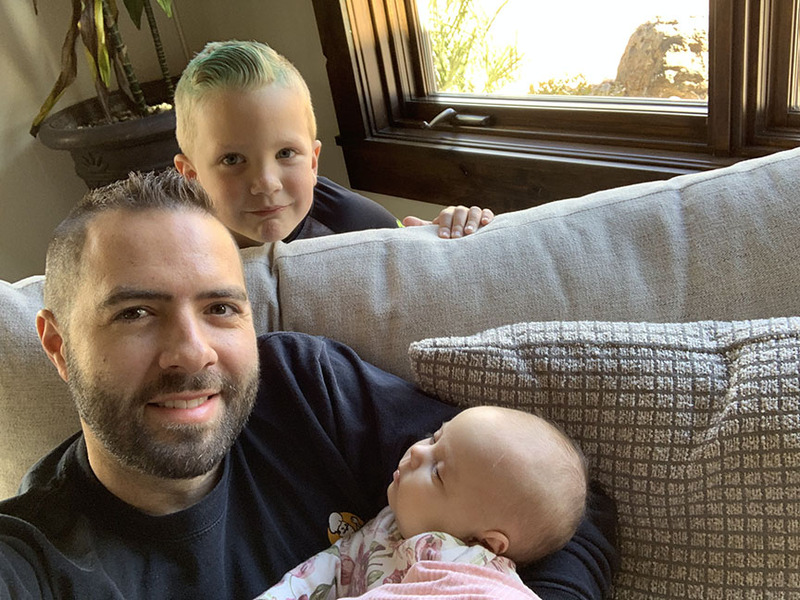 Chris and his team have taken the initiative to create the “Heritage Program” which focuses on sourcing or reproducing critical parts which have been discontinued. 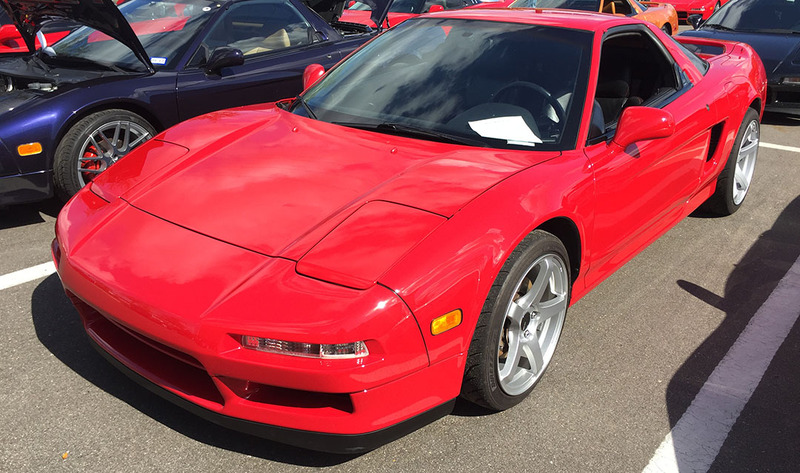 For example, the NSX “twin disc” clutch has been discontinued from American Honda so owners who are seeking to buy a “factory” replacement part are left having to seek other aftermarket alternatives. 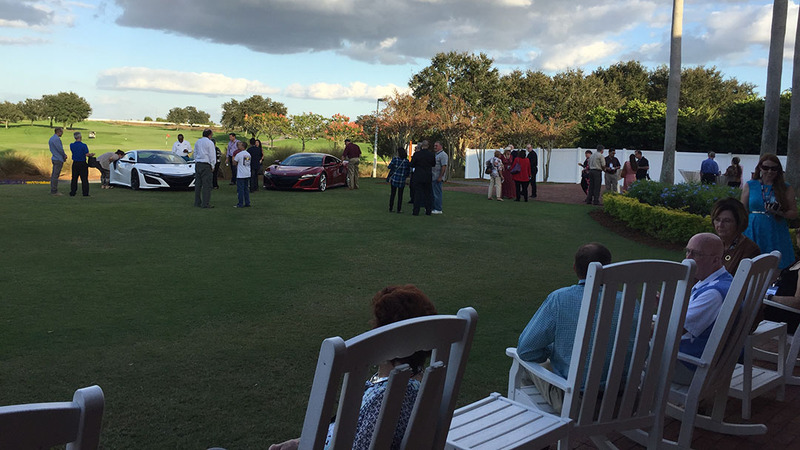 Just a few miles up the road, the Orange County National Golf Club hosted our large group in a banquet room for a formal dinner and program that evening. 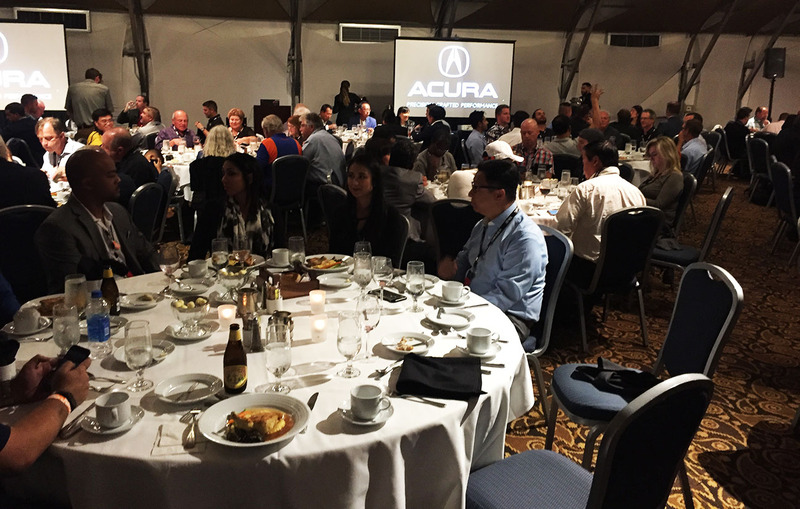 Keynote speakers included Ted Klaus, Project Leader for the NSX, as well as seasoned race veteran Peter Cunningham who has recently taken a new role in leadership for the RealTime team, as well as others from Honda R&D. Peter will be at the helm for the 2017 season race campaign of the NSX “GT3” racecar. 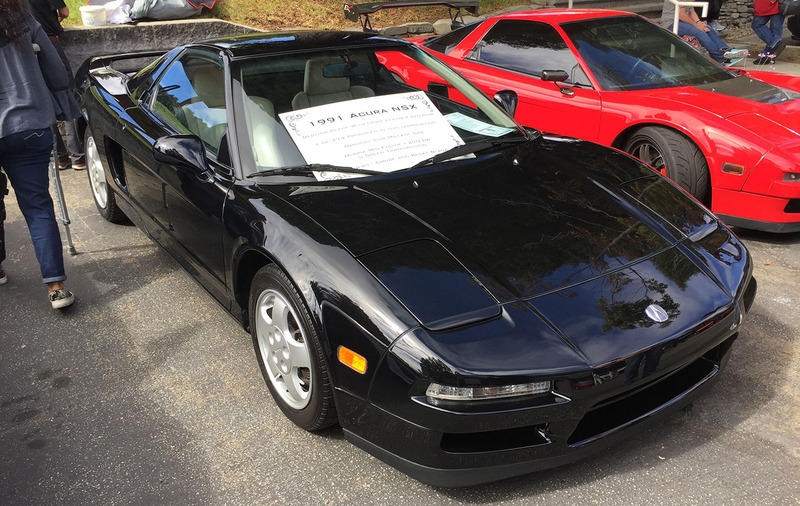 I happened to be seated at dinner across from a guy named John who’d just finished a 13,000-mile cross-country road trip in his own Berlina Black 1991 NSX. I was in good company! Oooh, fancy awards. Everything about NSXPO was high class. 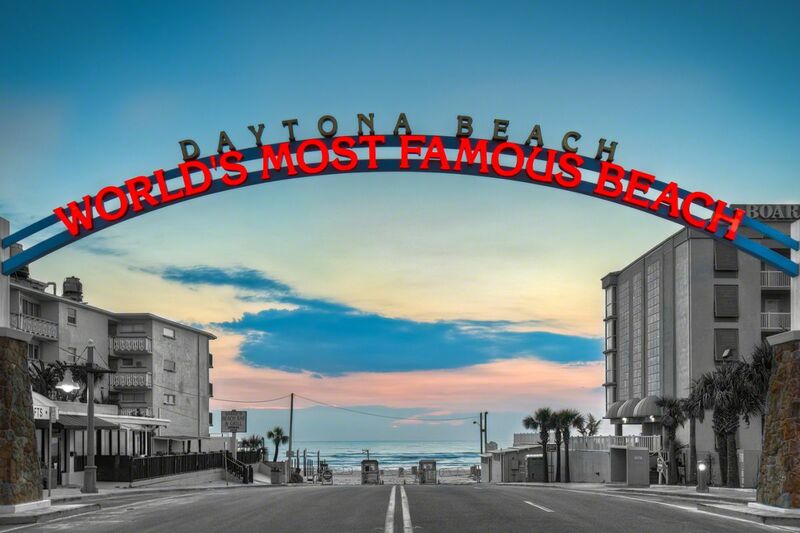 No trip to Florida would be complete without a stop at the state’s most exclusive and exciting theme park: “Legend Land.” Otherwise known as Alan Jackson’s house in Floral City, Legend Land has become a mecca of sorts for the Legend enthusiasts. Alan and his wife Nancy welcomed me to their beautiful estate where we enjoyed a lakeside lunch of Italian sausage and homemade potato salad. 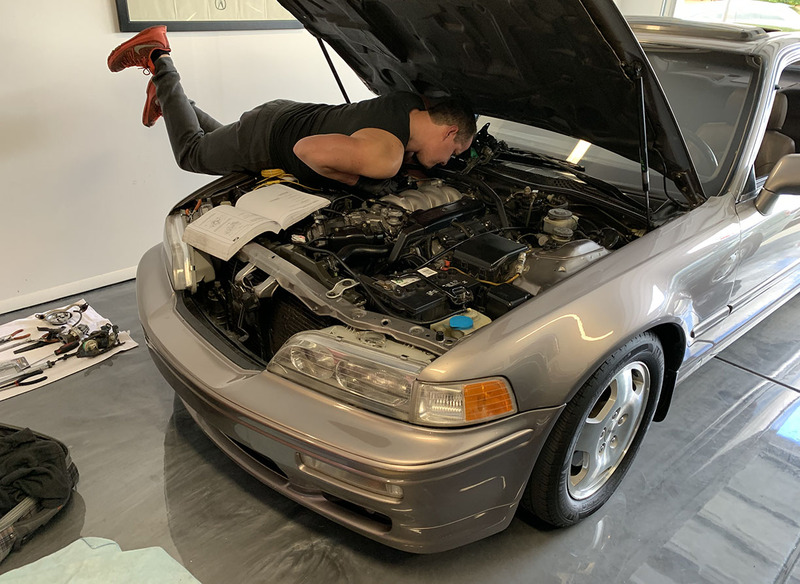 I also got to witness firsthand the replacement of a left rear wheel speed sensor on a 1994 Legend coupe belonging to local enthusiast Thomas. 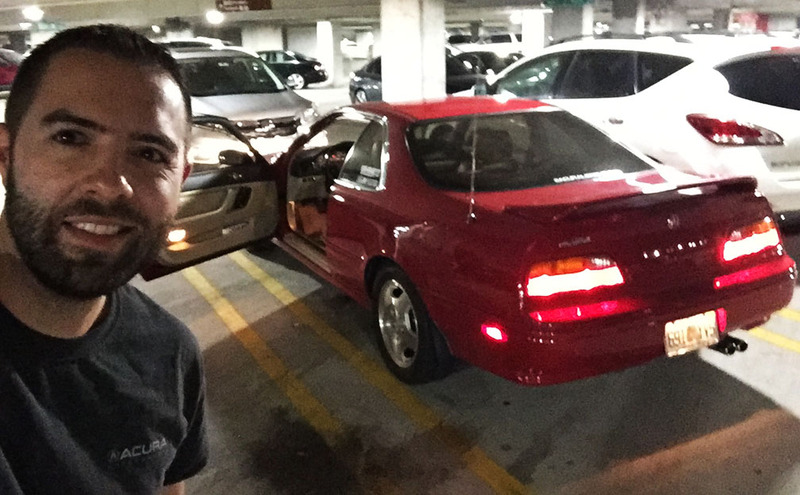 My friend Alex took me back to the airport in his 6-speed BMW 5-series. 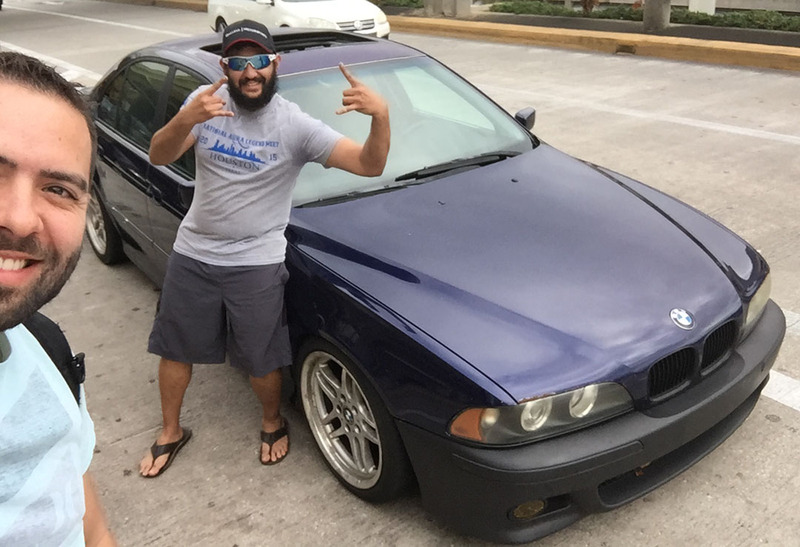 It had quite the roar thanks to its V8 and custom exhaust system. 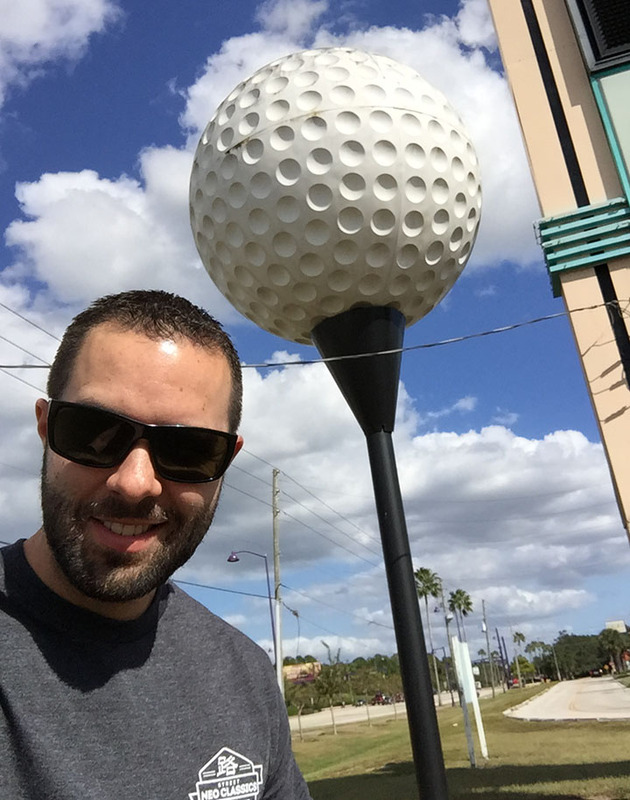 Though short, my visit to Orlando was definitely sweet and I was glad to reconnect with old friends as well as make a few new ones. Thanks for coming along for the adventure! Enjoy a few pics & a short video. 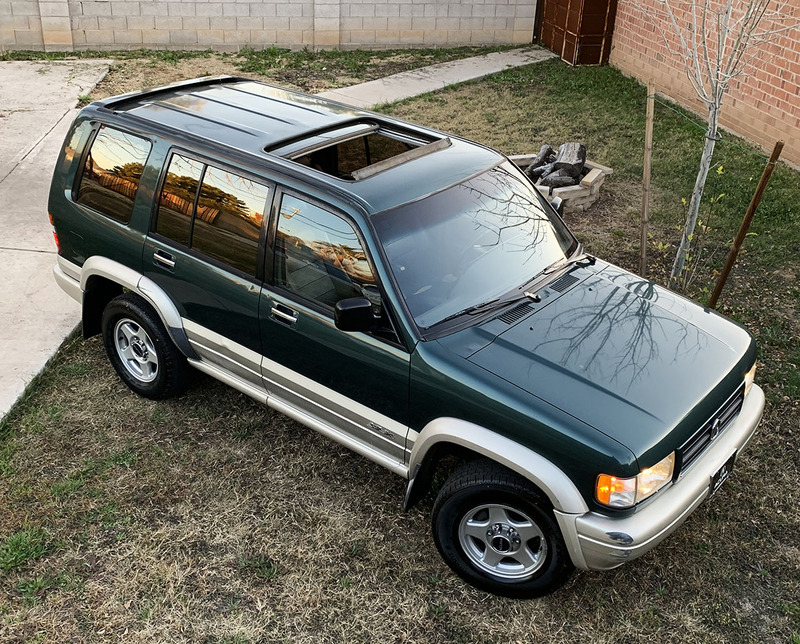 Hey, that doesn’t look like an Acura ZDX to me! Nice try. Love this “Monaco Blue” color. It’s rare! 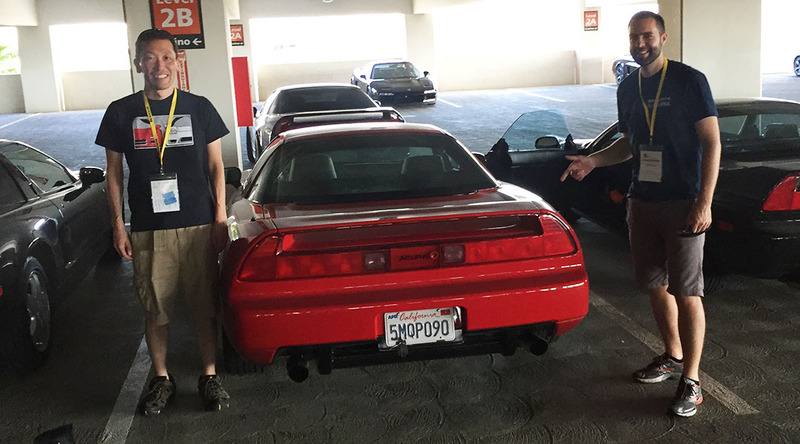 My friend John Komar (right) and his brother both brought their NSXs out. I got a kick out of his comment on the judging form in response to “why he should win” the Best of Show. Imola Orange Pearl. Pictures don’t do this color justice! Notice, even the leather interior was orange! A few 2017 NSXs were on hand, including this Valencia Red beauty. Poolside at the host hotel. Orange County National Golf Club, cocktail reception. Sunday morning drive to Floral City to return my rental car. 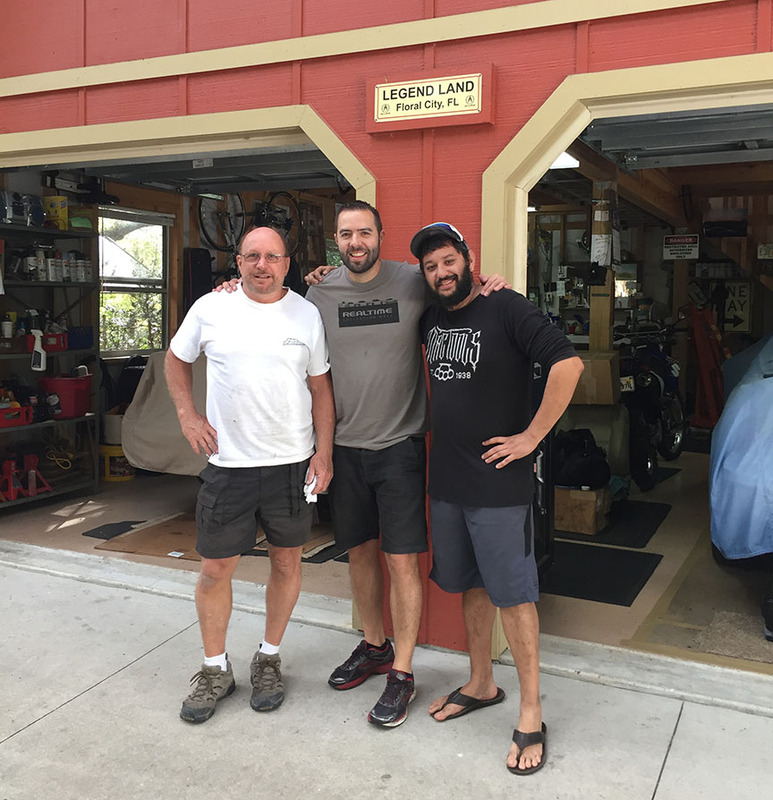 Arrival at Legend Land, pictured here with Alan and Alex. 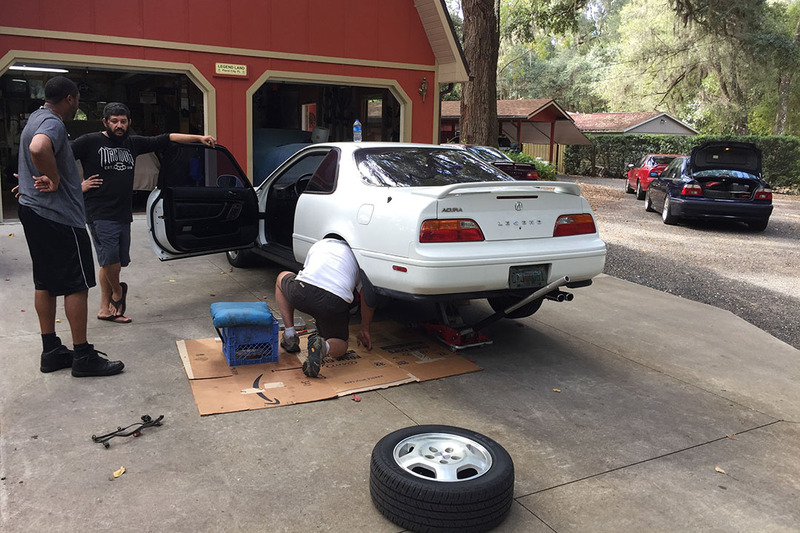 Working on Thomas’ Legend coupe. 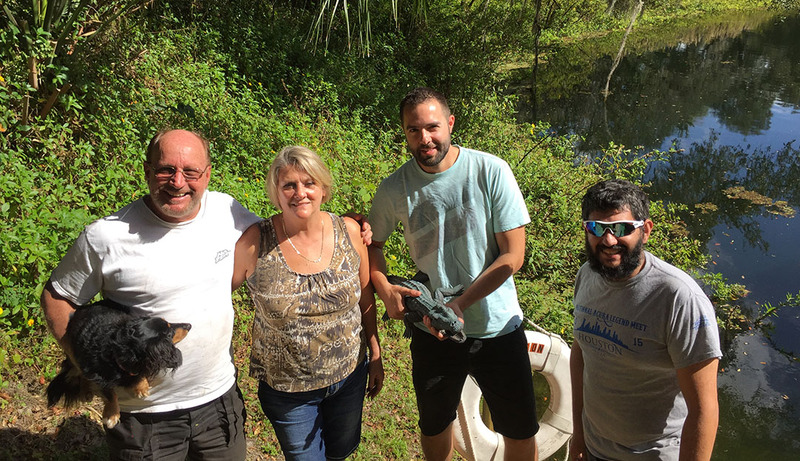 Quick shot with Abby (the pup), Nancy (Alan’s wife) and a gator statue. At long last, the event that I’d helped to plan for about a year has reached its conclusion and I must say, it’s been a wild ride. 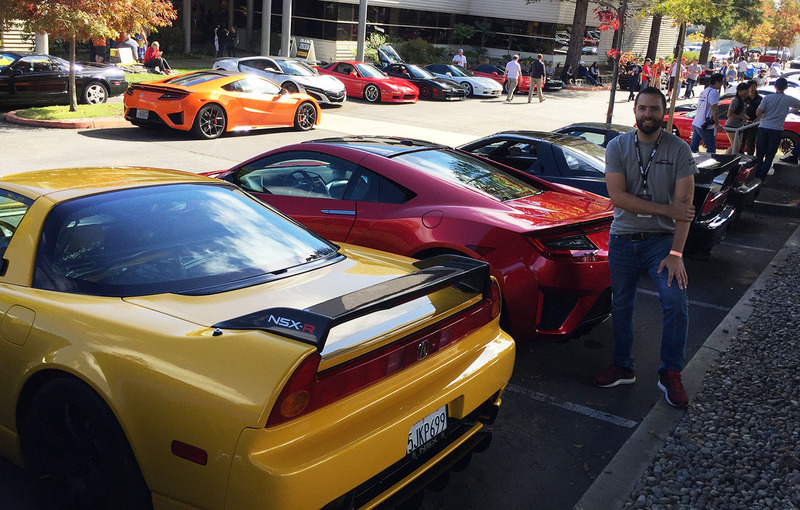 Here are a couple more photos that surfaced of this year’s NSXPO / 25th anniversary NSX event. First, our parade lap from Friday at Thermal raceway as captured by Bob Ondrovic. I was only 3 or 4 cars back in the right hand lane (left as viewed in this image). 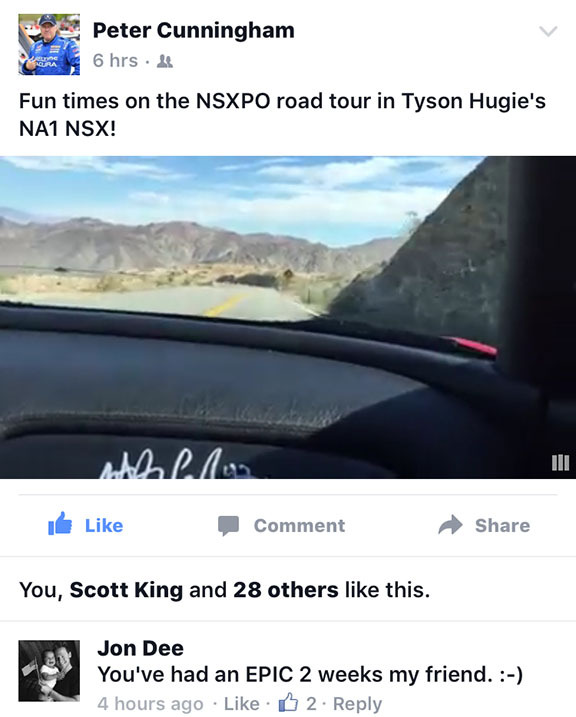 Seasoned race veteran Peter Cunningham posted a short video (taken by his copilot) that was filmed while driving my car on yesterday’s 100-mile scenic route. I was happy to lend him the keys, and he even left it full of fuel for me! This guy has claimed 91 professional race wins, so I hope he had some fun with my ride. Closing ceremony last night, as taken from standing at a distance. 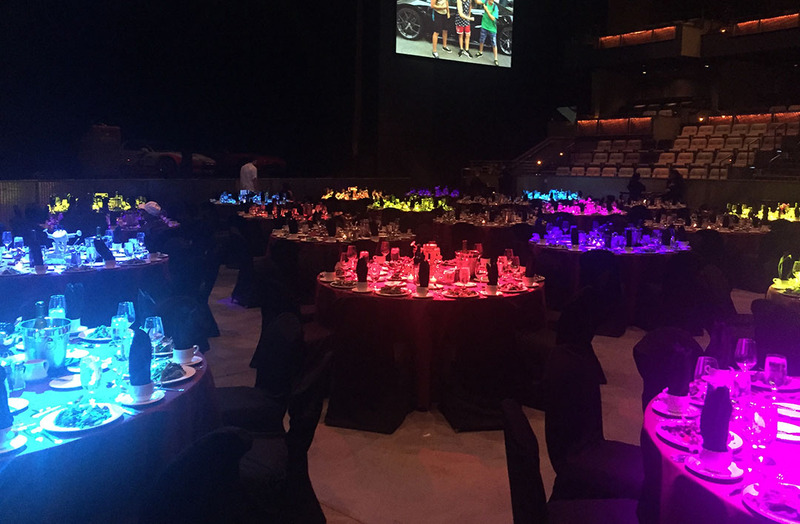 Each dinner table was illuminated in a different colored spotlight. I never got to see the stage from this angle because I was always either backstage helping with something or seated at one of the front-row / reserved tables. 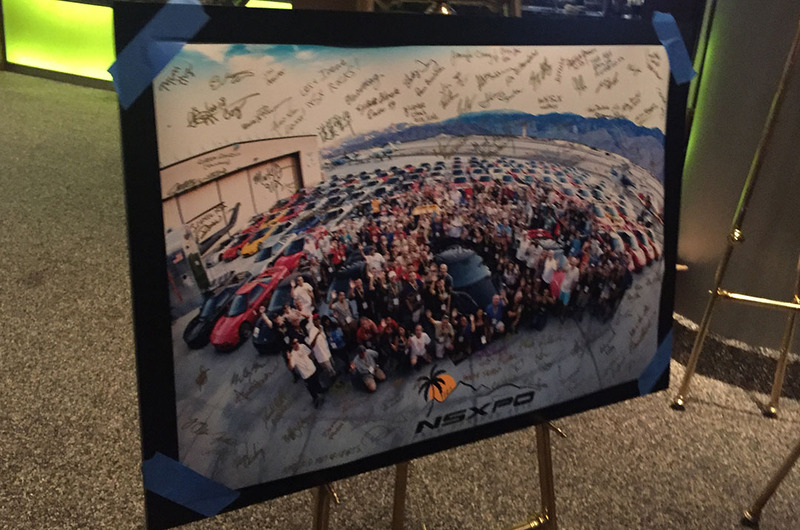 The NSXPO Planning Committee members handing signed group photos to Acura representatives, with Event Director Chris Willson at the mic. Today’s events were very casual in nature. Most of our attendees have long drives ahead of them. Each of the three times I had to get in the elevator at the hotel to return to my room and pick up a few things to pack up my car, I ended up sharing the ride with other folks who were there for the event. One gentleman was about to embark on his return drive to Vancouver, British Columbia. 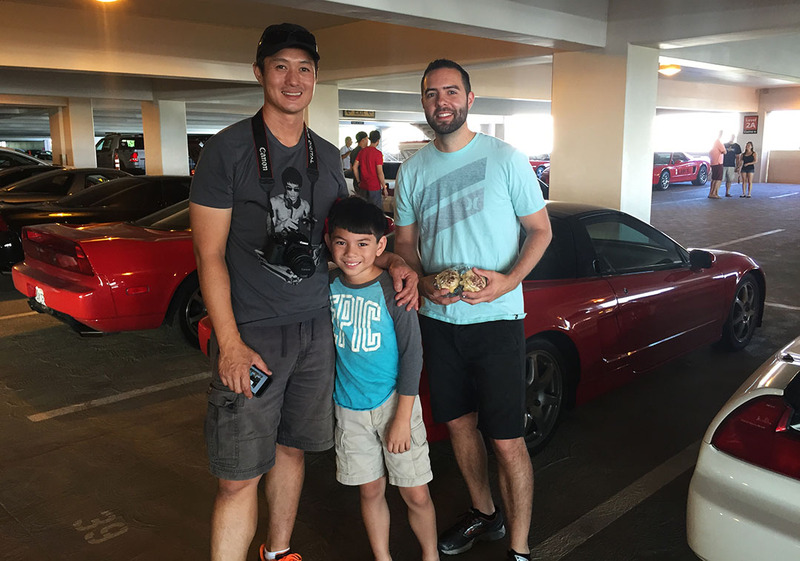 A few newcomers joined us on the second floor of the parking garage for an informal car show, including my friend Ramon and his son (who also brought me some delicious cupcakes which I’m holding in this photo). The casual meet & great was a nice break from the very rigid schedule we had all been abiding by for the previous few days. 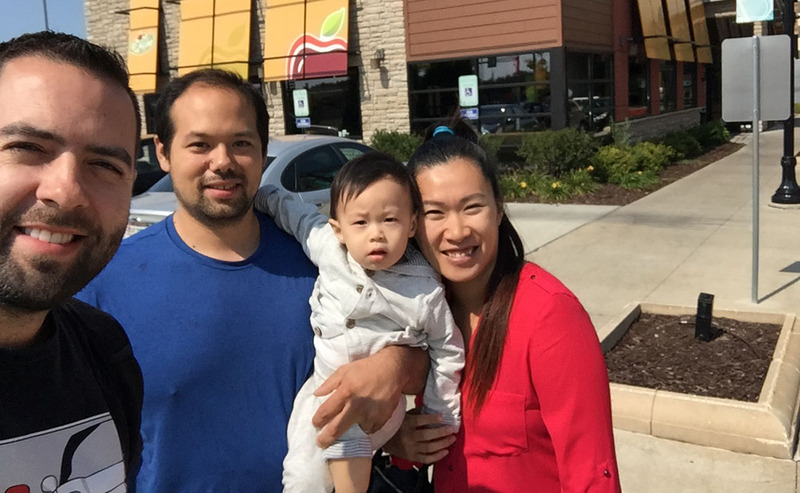 Knowing that I had a nearly-5-hour drive home myself, I decided to head eastbound by about 11:00 in the morning, but not before taking a quick photo with my friend Ben Lin. 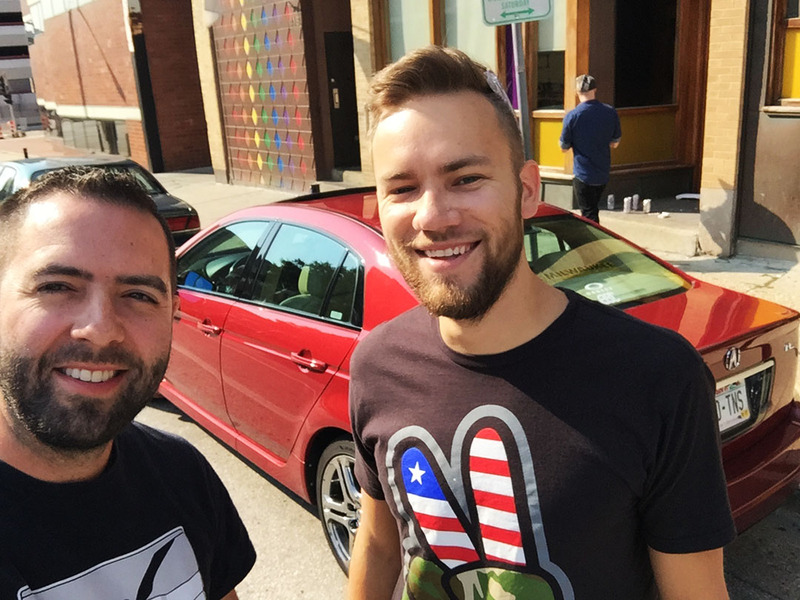 The photo was necessary since Ben & I both attended the NALM (Legend) event in Houston a few weeks ago, so we wanted to document the fact that we were now again together at a different car-related program, only 1,547 miles away from the last meet-up. Ben’s 2005 “Silverstone” car has the updated 2002-05 front end. 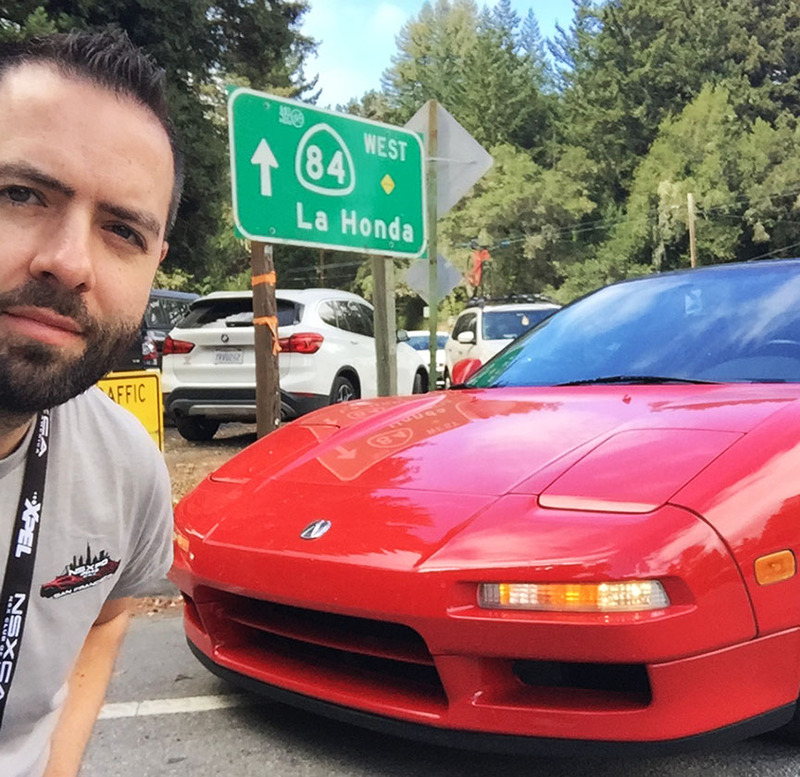 I also met NSX Club of America member “Dan.” He’s the proud ORIGINAL owner of a 1991 Formula Red NSX. 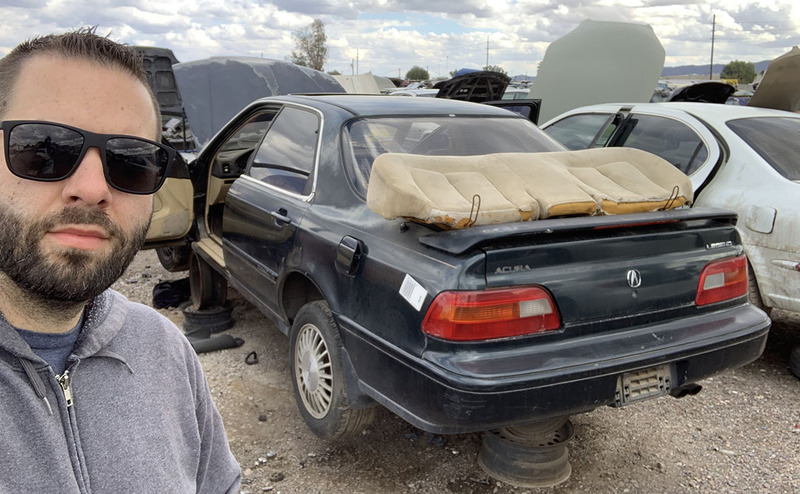 Though the paint has faded and the car has over 200,000 miles on the odometer, he has hung onto it for 25 years and doesn’t plan on selling any time soon. I only wish I’d taken a photo of the 25-sticker-thick stack of registration renewal stickers on his license plate. 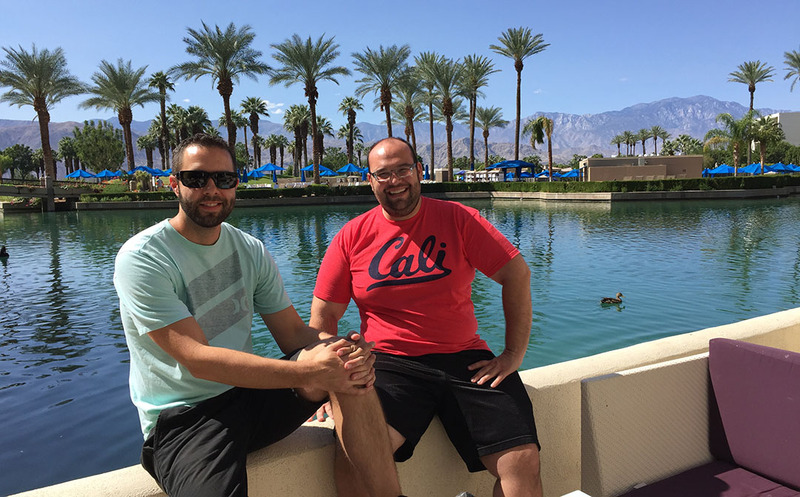 I cruised over to Rancho Mirage area and had brunch with my friends James & Daniel who happened to also be in the area. Couldn’t help but take a photo at this storefront entrance near the JW Marriott property. Perfect setting for a relaxing Sunday bite to eat. 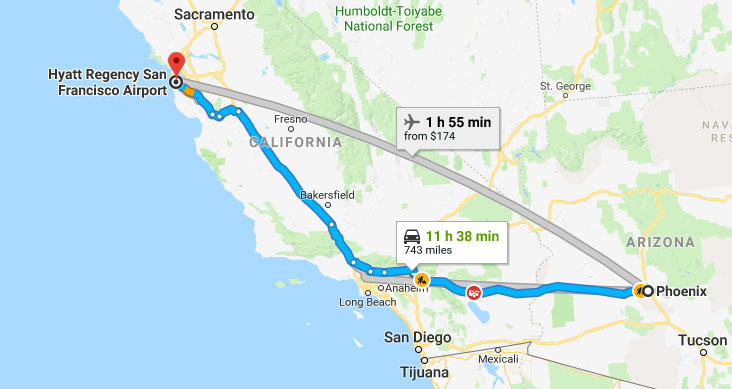 My 297-mile eastbound return trip to Phoenix on I-10 was uneventful and I honestly didn’t even turn on the radio until about 3 hours into it. My mind was enjoying the solitude and silence – it needed time to process & download the busy activities of the last several days. 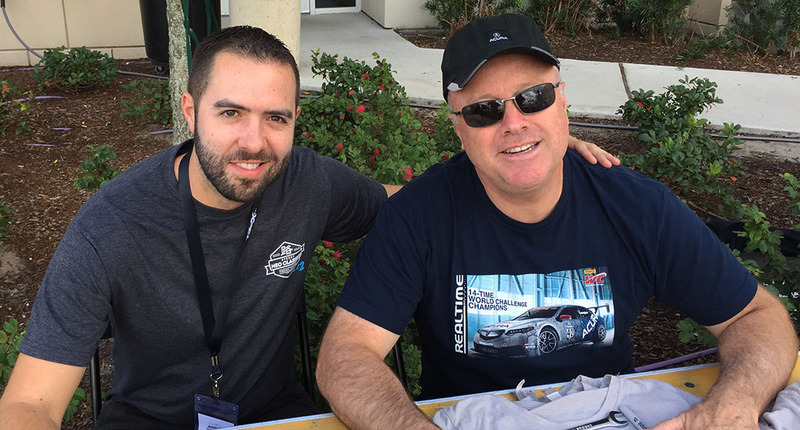 I did happen to pass our HPDE instructor / Sponsorship Director Jim Cozzollino a couple of hours into my drive! He gave me a wave and I blew past him. Hope you enjoyed the ride over the last few days! 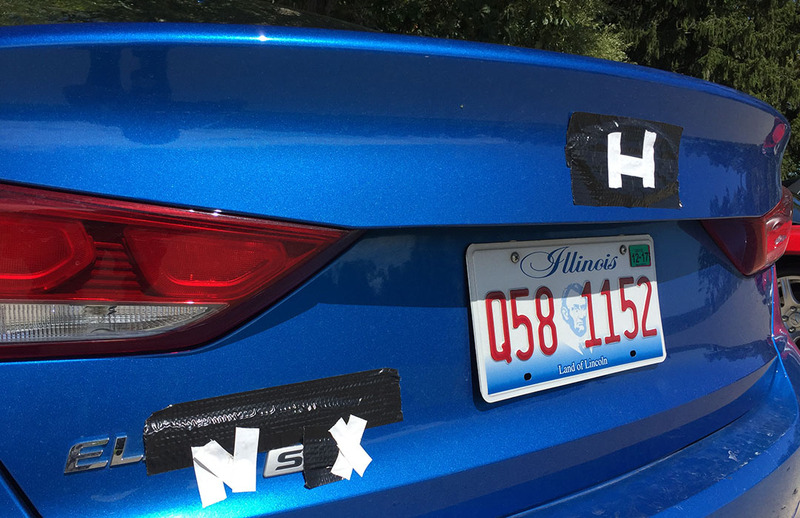 I put over 13,000 miles on NSXs today. Considering I’d guess about 130 people took today’s 103-mile scenic drive that I helped plan out, that comes out to 13,390 miles. 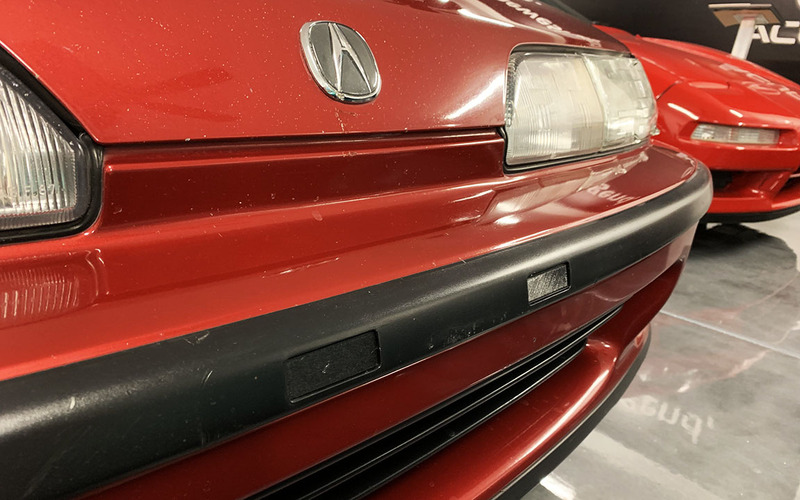 So – sorry to all those collective NSX owners who have lowered the values of their pristine low-milers on account of me! It was another “crack of dawn” type of morning for me and it’s been a very busy day on the go. 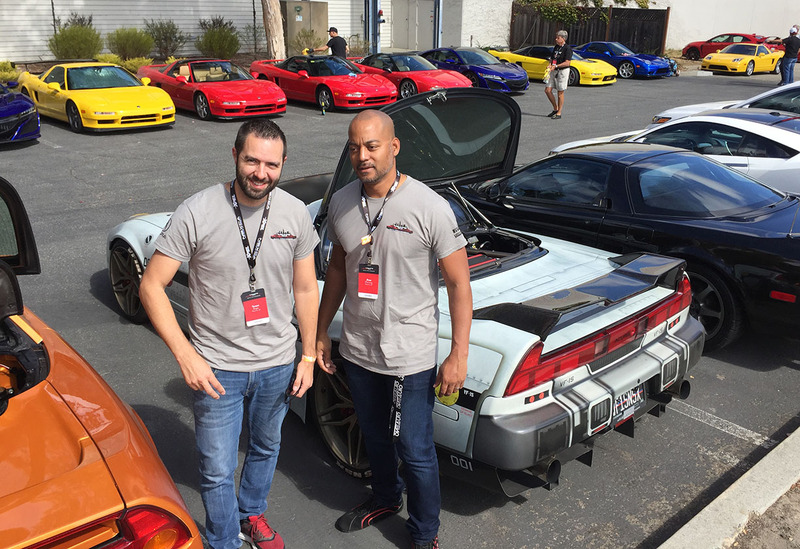 We’ve just concluded this year’s formal event out here in Palm Springs with exception of an open-to-the-public aspect of NSXPO called “NSX-tra” which will take place tomorrow morning. Our participants on today’s mountain drive on the Palm to Pines Scenic Byway started lining up in the surface parking lot around 7:30 in the morning. Prior to today, I had driven this same route a couple of times. This time, it was the real deal. 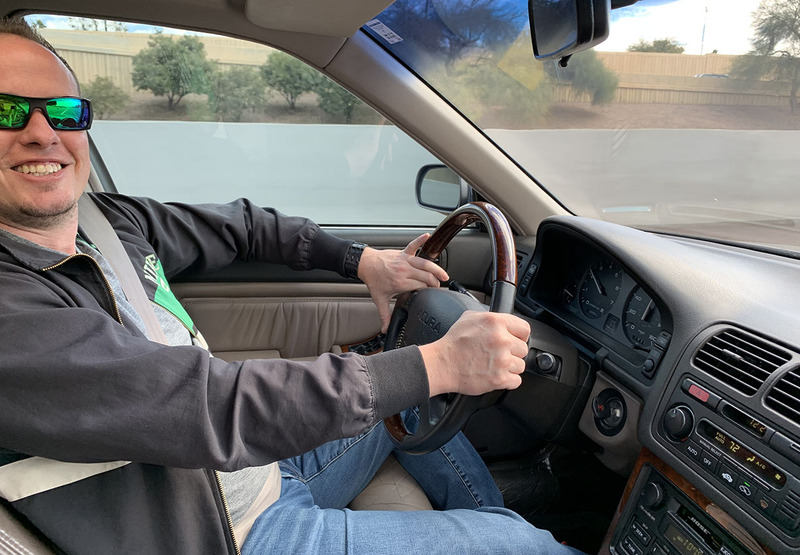 My own car was piloted by Peter Cunningham and his wife, so I had the great opportunity to hop onboard with a couple of other gracious drivers who had a passenger seat available. 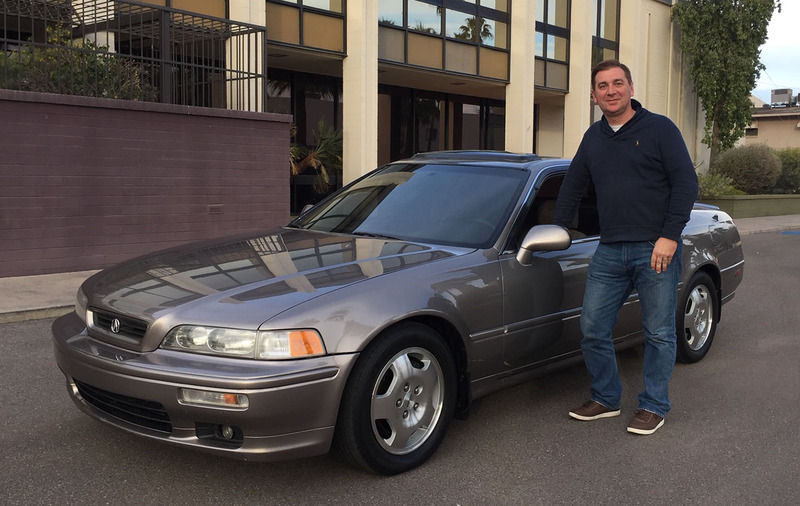 The first was John in a 1992 Berlina Black model with 110,000 miles on the odometer. 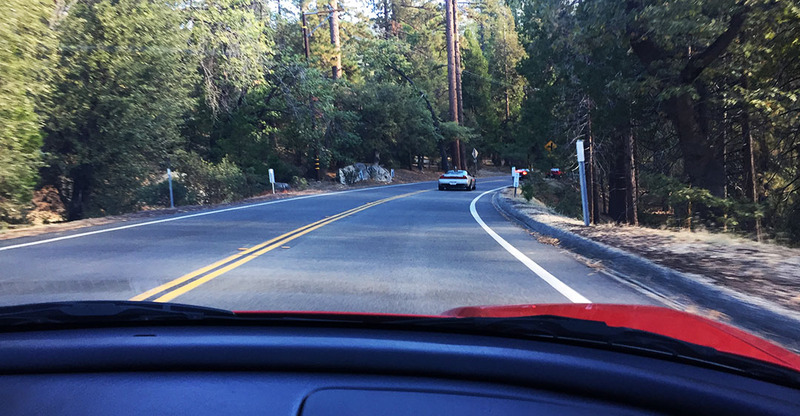 We cruised the 30 miles out to Banning and then re-staged the cars to wait for a couple of the other drive groups to arrive before proceeding up the mountain. 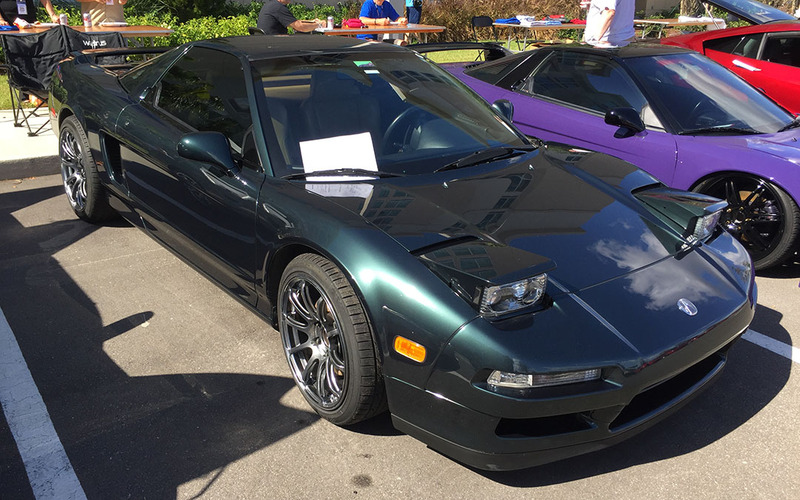 The next car I hopped into was a rare (1 of 50) 1999 “Zanardi” edition NSX owned by Glen Kawano of San Diego. 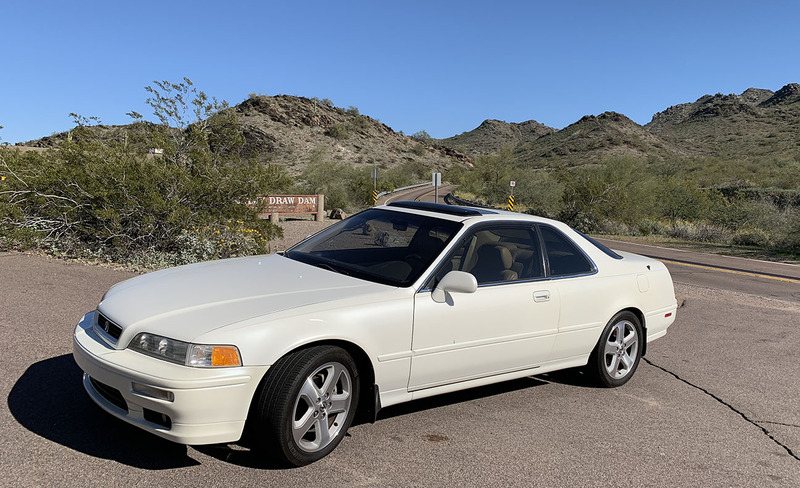 His car handled the curves amazingly, and I enjoyed getting to know him over the course of the next couple of hours while we made the loop via Highways 243 and 74, back to the host hotel in Rancho Mirage. Peter took great care of my car and while he was still out and about with it, I made use of his Cadillac SUV rental car! The timing was perfect because I had to run over to Walmart and pick up some receptacles for raffle tickets. 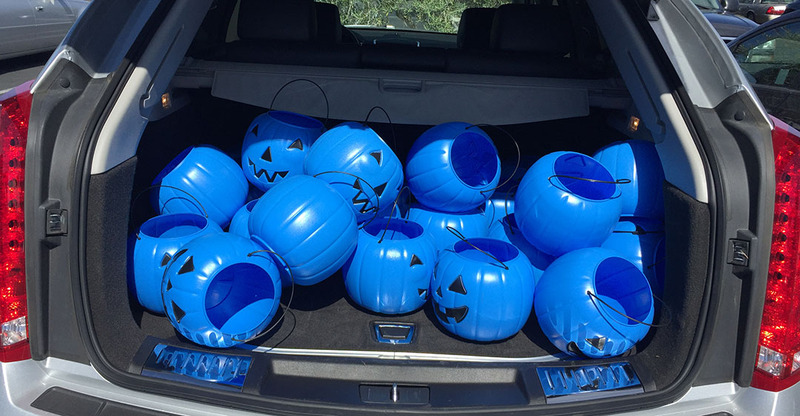 It just so happened that the most suitable (and cost efficient solution) was to buy 26 blue plastic pumpkins at $1 apiece. You should have seen the looks people were giving me as I rolled through the checkout line with a heaping cart full of blue pumpkins. LA Prep arrived to get some cars loaded up on the stage for the evening’s show, so I gave them a hand with load-in. 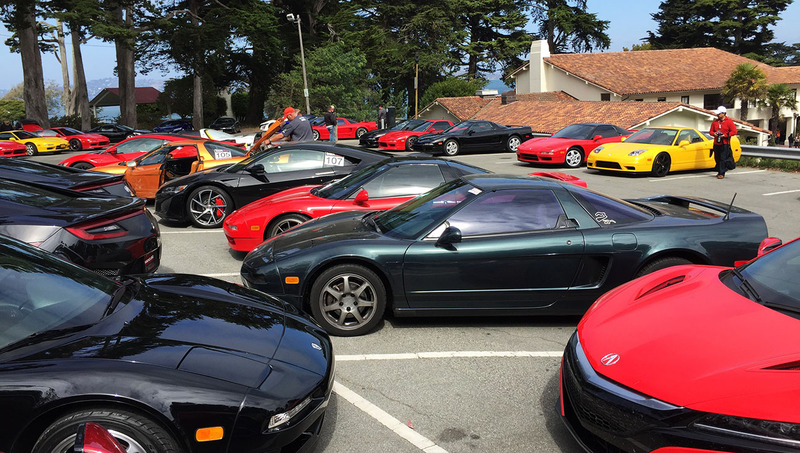 We arranged the Zanardi NSX, the new NSX, the RealTime Racing NSX, and a club member’s car (an all-original 1993 that had driven the farthest @ over 3,000 miles from NY). 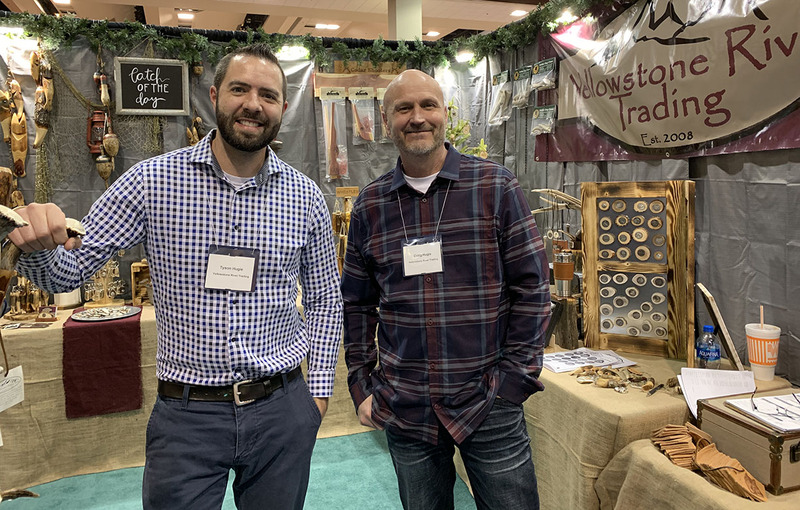 Our cocktail hour and vendor merchandising show kicked off at 4:00 p.m., and doors opened to the banquet hall at 7:00. Our attendees were treated to a feast for the ears, eyes, and tastebuds for the rest of the evening. 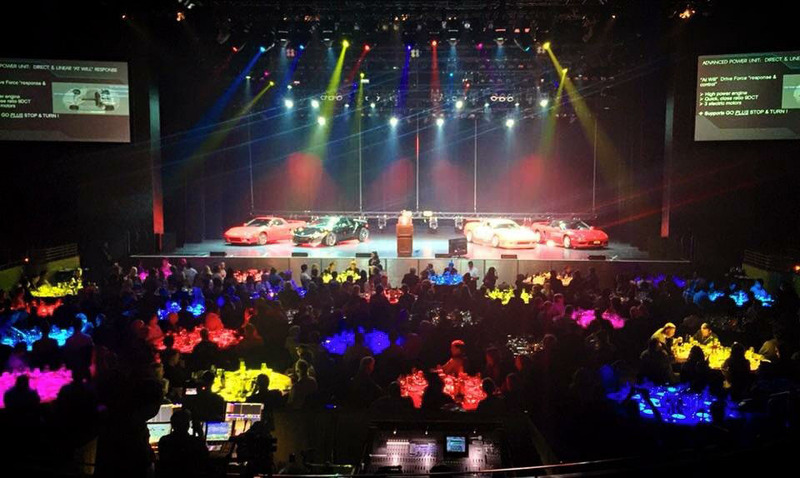 NSXPO director Chris Willson kicked off the ceremony with a few words, and then the curtains opened to show the gleaming cars on stage while a dramatic 2-minute Acura “brand” video played on the huge screens flanking the stage and the spotlights danced around energetically. It was awesome. 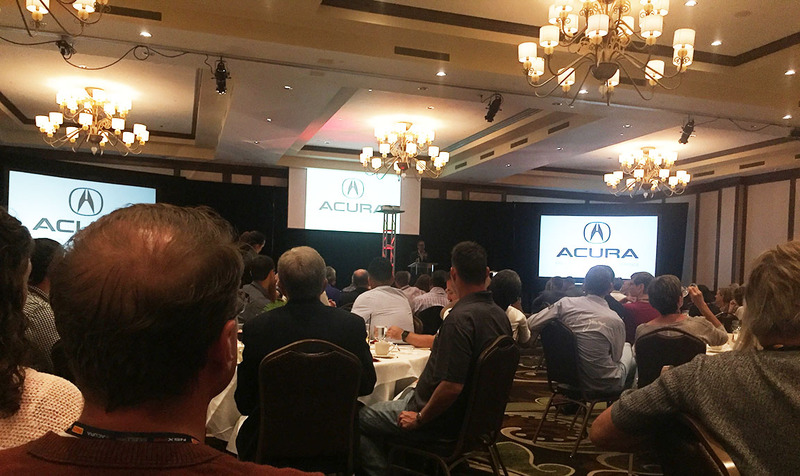 Our keynote speakers were Michael Cao, Acura Interior Design Project Lead, Ted Klaus, Large Project Leader for the new NSX, and Peter Cunningham, award-winning race champion over his 30-year career with the RealTime Racing team. During this same time, dinner service was provided. I had to laugh when Peter gestured to the racecar behind him. 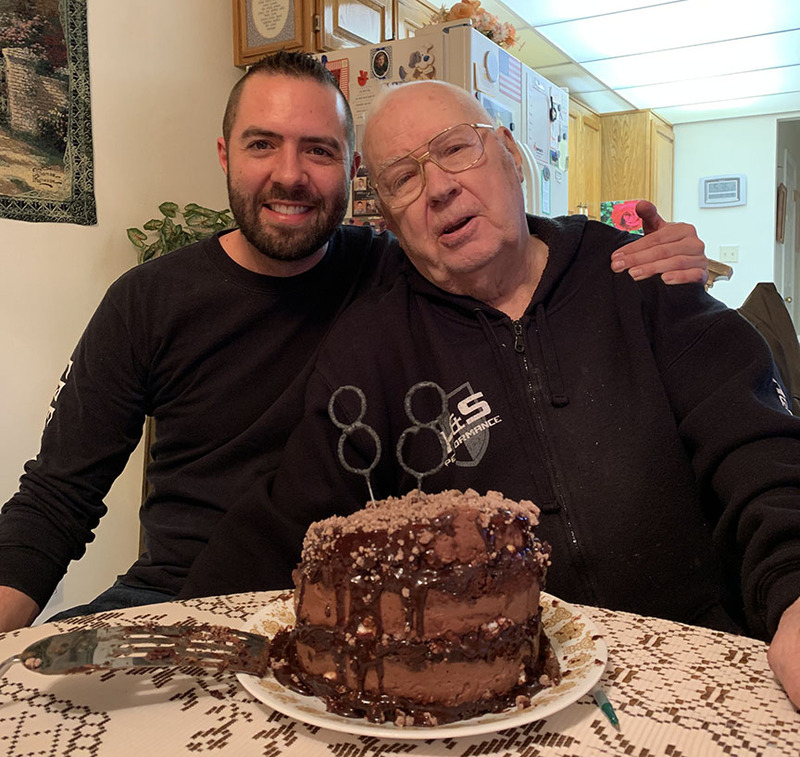 “Well, the right rear quarter panel on that car is original,” he started, “but the rest has been through a lot.” We took a short intermission after Peter’s comments and gave people one last chance to buy raffle tickets for the $30,000 in prizes to be given away. 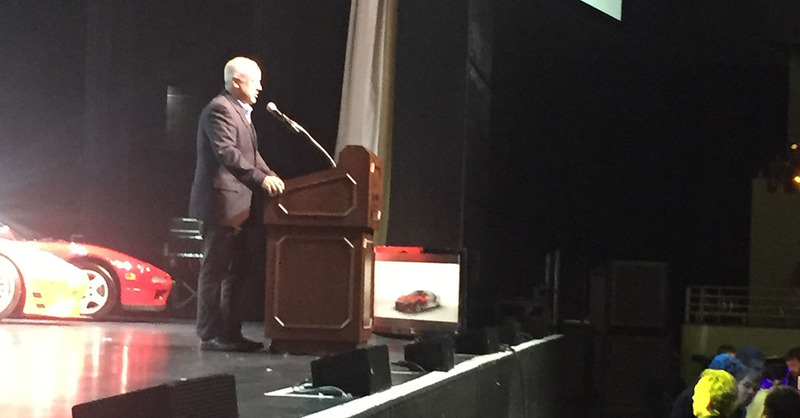 Jim Cozzolino took the stage to draw tickets for 26 prices, the biggest of which were a $2,500 clutch from Exedy and a $3k set of Rays wheels. 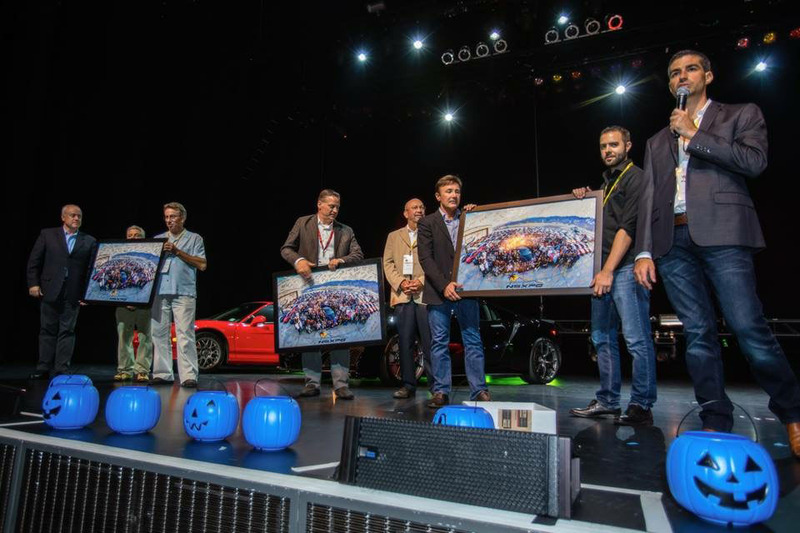 The conclusion of the show was the presentation of signed & framed posters featuring all the attendees grouped around the cars (the photo that was taken on Thursday night at the air museum). Recipients of the posters were Ted Klaus, John Watts, and Peter Cunningham. I must say it was an honor to spend the evening among the likes of such high class people. The level of camaraderie and respect has been extremely evident throughout this entire event. 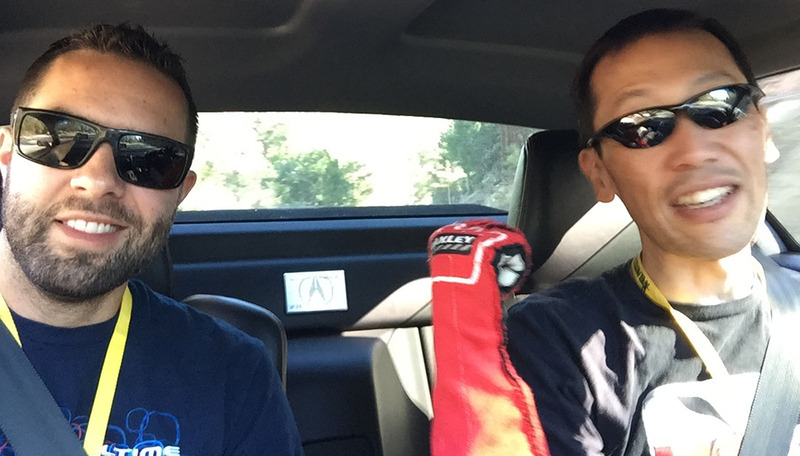 Riding with Glen in his Zanardi. 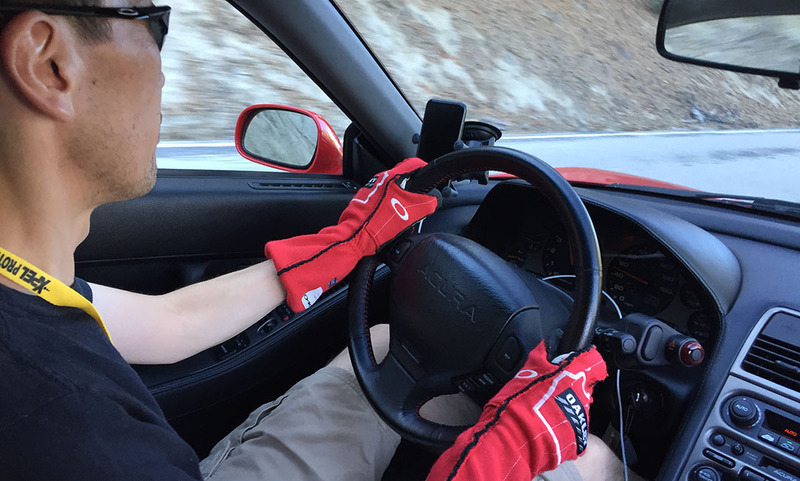 Check those driving gloves! At 6,000 feet in elevation, it was THIRTY degrees cooler than we had yesterday at the track in Thermal! 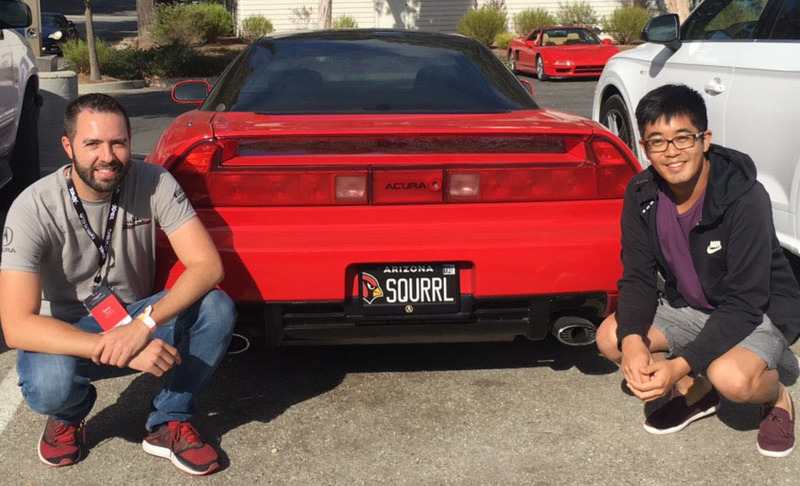 Ryu Asada – NSX owner and Mattel employee. 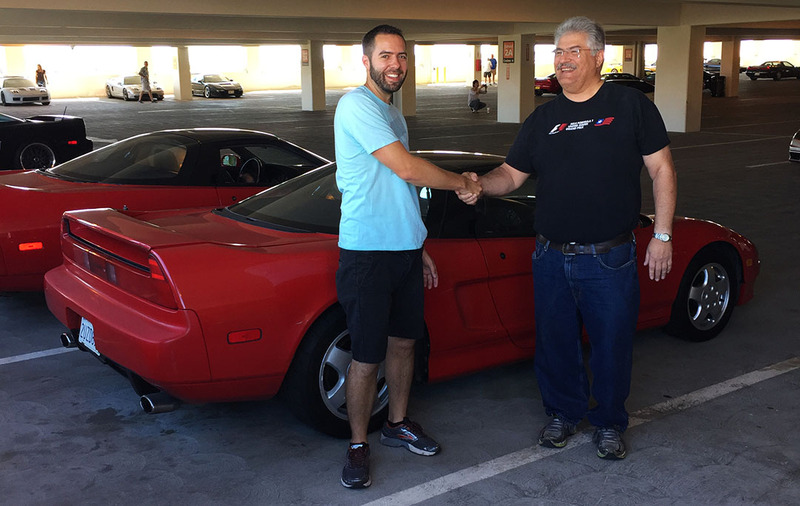 He designed the Hot Wheels NSX! 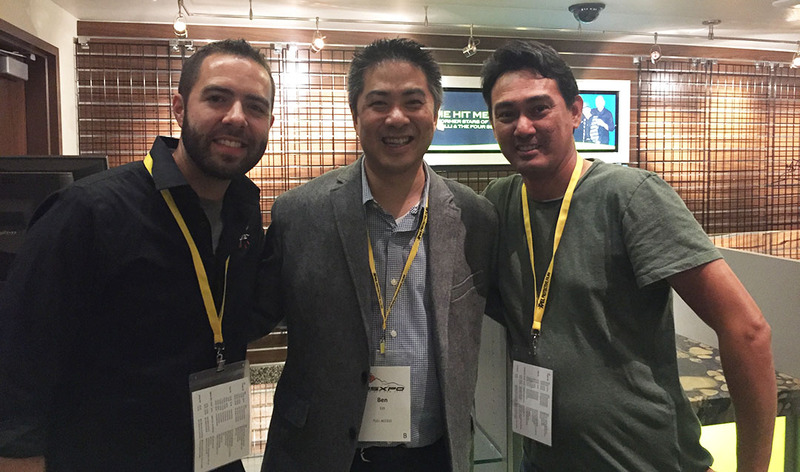 With Ben and Graeme – these guys are my Legend brothers. 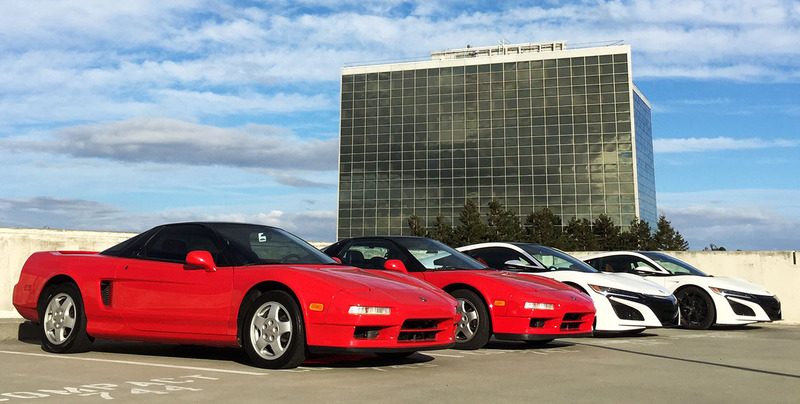 The 3 of us all have Legends & NSXs. And lastly, our NSXPO Planning Committee, minus NSXCA Liaison John Komar. These guys have been amazing to work with. 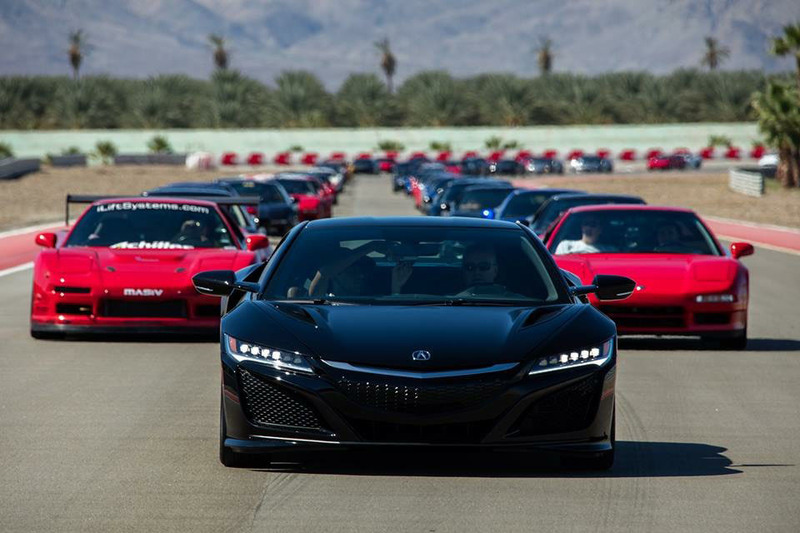 An exclusive members-only track facility called The Thermal Club opened its doors for our NSX owners today! General Manager Brent was happy to roll out the red carpet for our event, and we graciously accepted the invitation. We had a day of hot weather and even hotter cars. 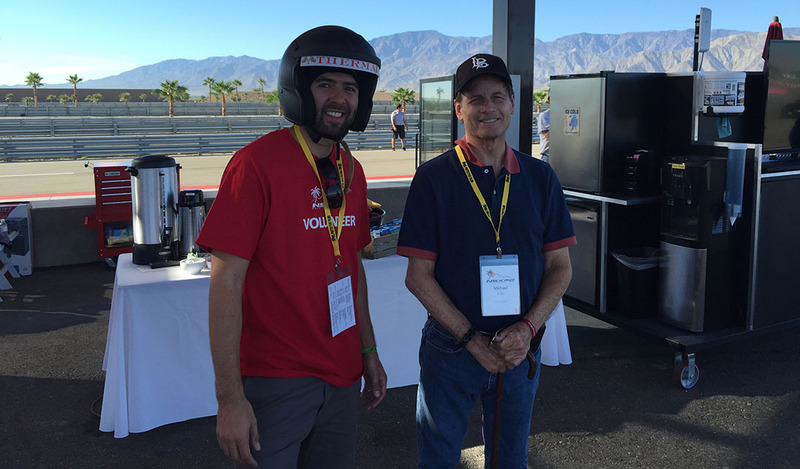 Somehow, we managed to make the most of our day before the oven – it was 102 degrees Fahrenheit when I left the track in the early afternoon – really started getting to us. 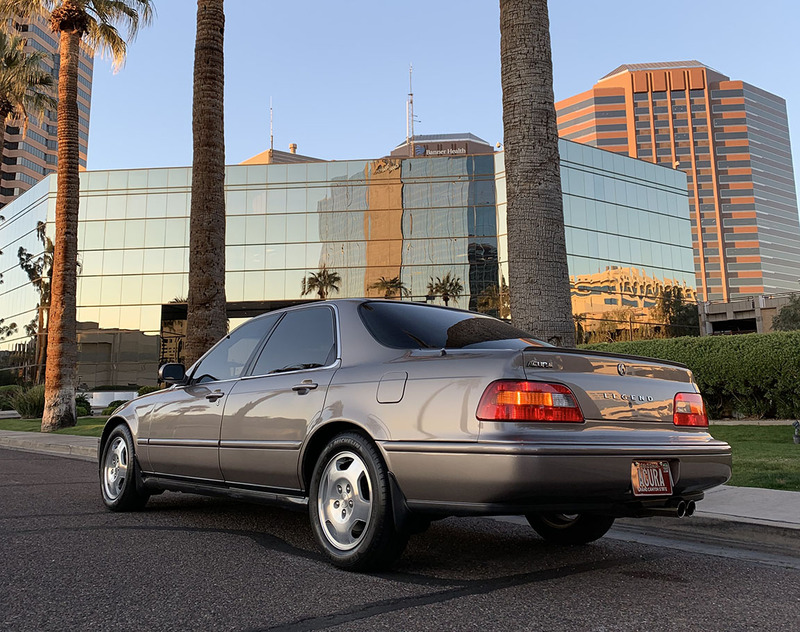 My day started off with a 4:30 a.m. departure from the Agua Caliente host hotel for a 40-minute drive to the racetrack. 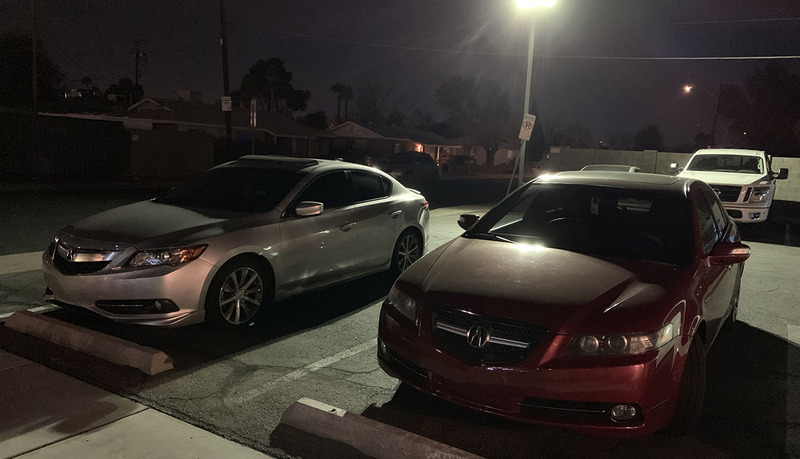 I recognized some jewel eye MDX headlights in my rearview mirror, so I knew the vehicle behind me must’ve been full of Acura folks — and, indeed it was. 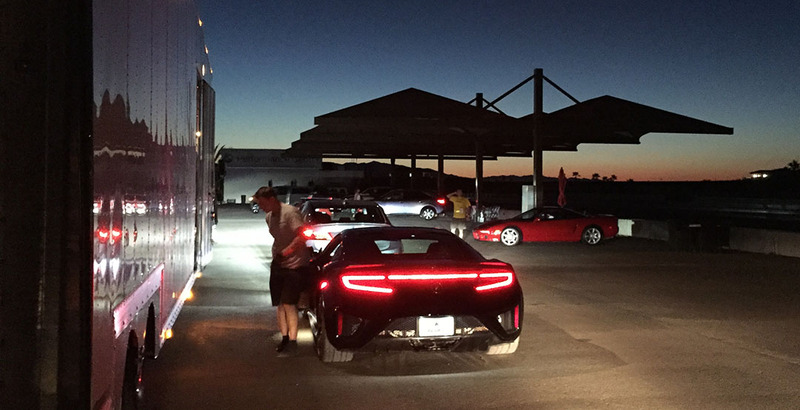 Over the next hour or so, we offloaded a TLX, an MDX, the RealTime Racing NSX, and the new black NSX from a huge transport truck that had brought them. 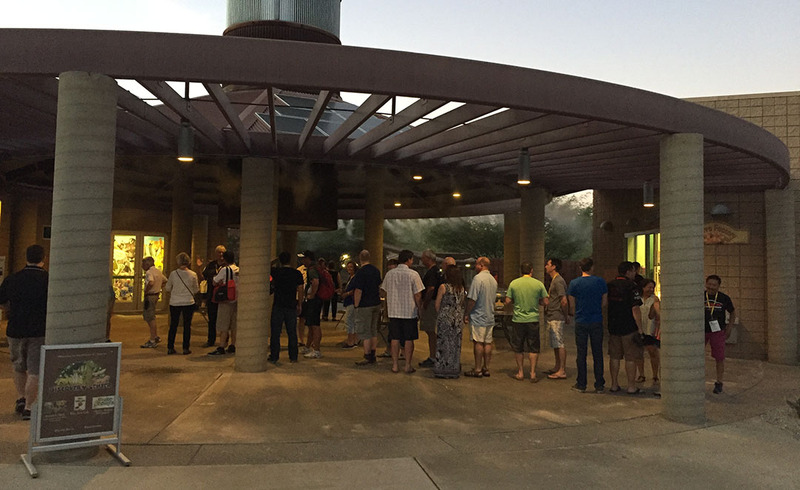 Our general attendees started arriving around 6:30 a.m. and it was a steady stream of incoming NSXers for awhile. 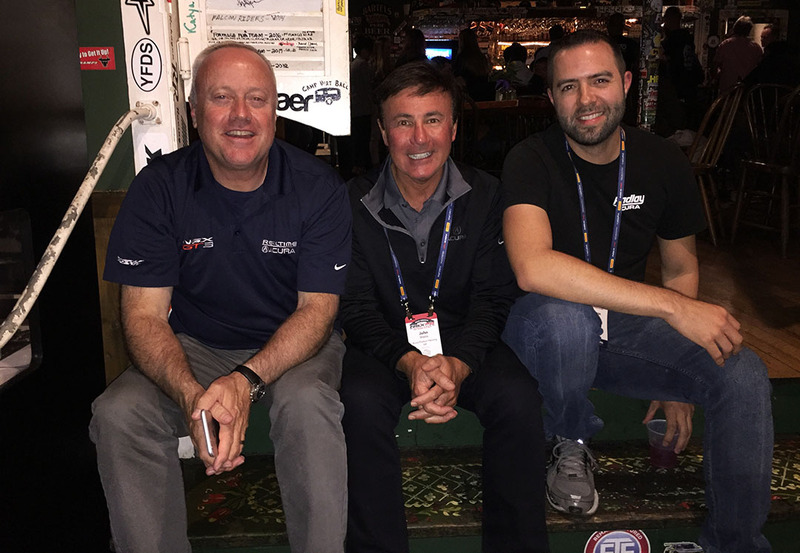 Our day was kicked off by High Performance Driving Education (HPDE) coordinator Jim Cozzolino, with a few remarks from Event Director Chris Willson as well as from Peter Cunningham. 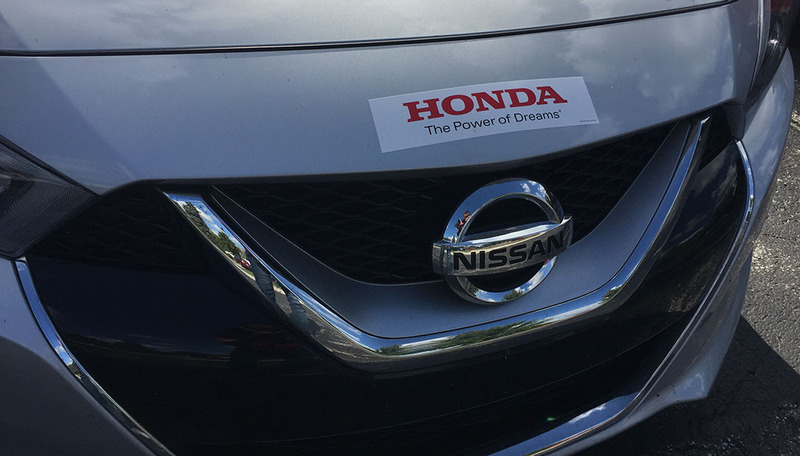 Our skidpad, autocross, and “South Palm Circuit” tracks opened up for business shortly afterward, and about 40 people cycled through three different “run groups” based on skill level. 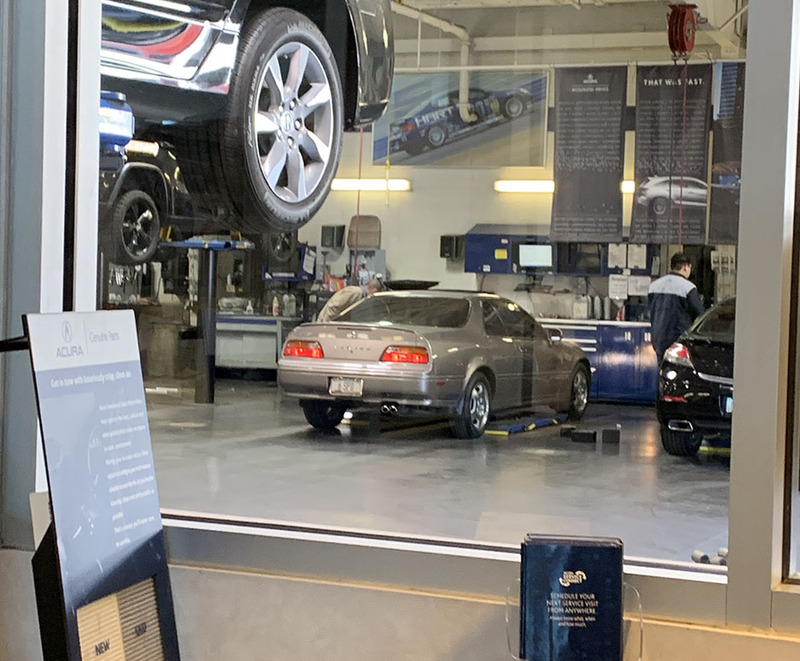 I didn’t participate in the performance driving activities, but I’m fairly certain that if I had, I would’ve been with the “Beginner” contingent. 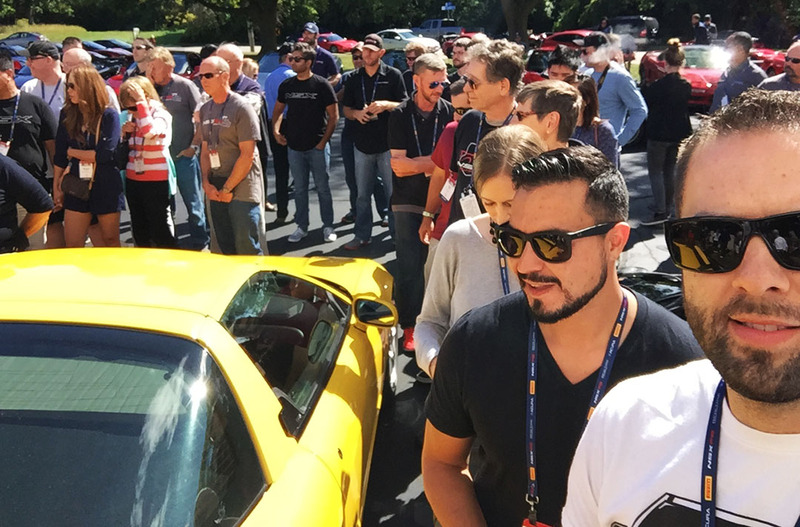 The rest of the morning was filled with that characteristic roar of NSX exhaust in the airwaves and the occasional screech of squealing rubber as the cars and people made the rounds. 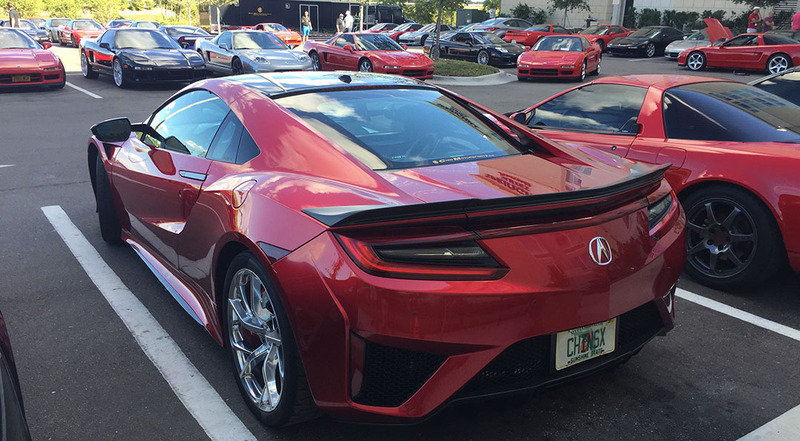 Ted Klaus and other key Acura engineering personnel showed up to educate us a little on the new NSX. 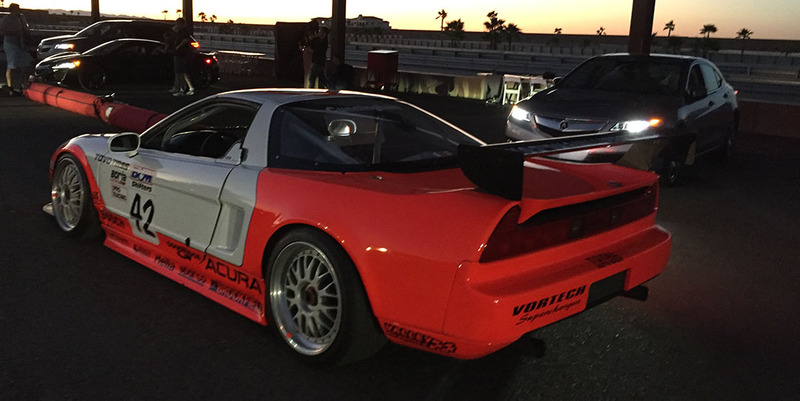 One NSX owner – and I’m sorry I can’t even remember his name – took me for a track ride in his Formula Red 1995 car. 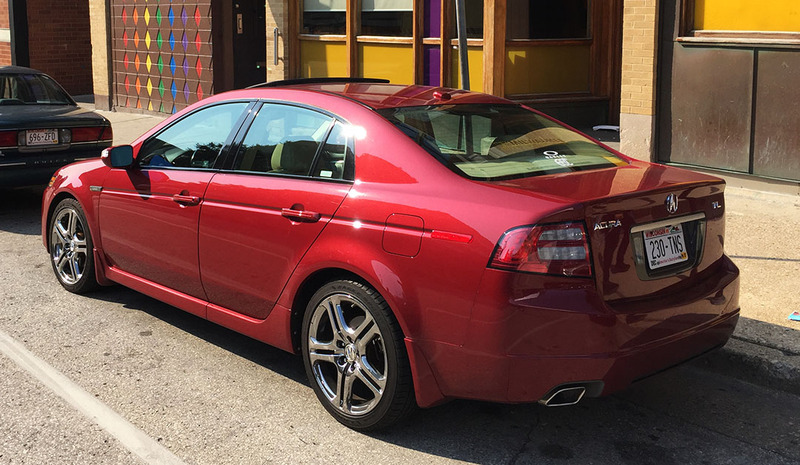 It was equipped with a Comptech supercharger, custom exhaust system, and upgraded suspension. 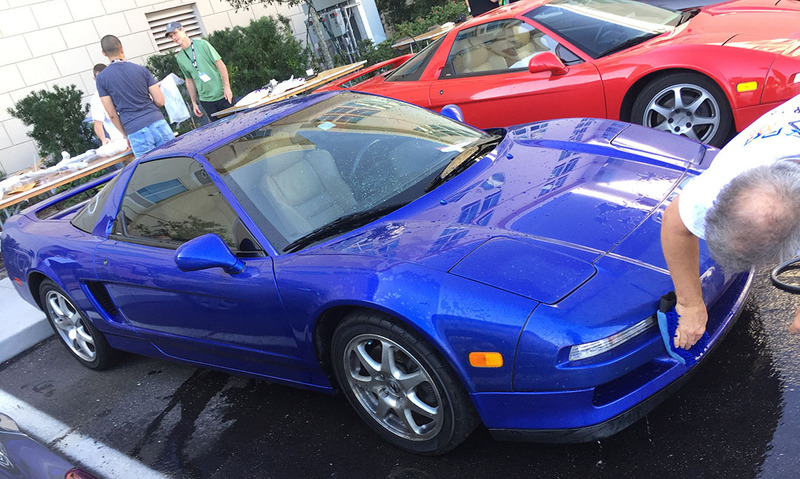 I was reminded of just how well the NSX handles when pushed in a performance driving situation. Lunch was served at an adjacent shaded pavilion – and thank goodness for those high-powered fans on the perimeter. The hamburgers and quesadillas were just what the doctor ordered, not to mention the generous availability of waters and Gatorades made available by Thermal track management so nobody in our group got dehydrated. Around that same time, Peter Cunningham took the wheel of the 2017 NSX – for his first time behind the wheel – and gave ride-alongs to the 3 winners of our charity raffle which raised $2,000 last night. They had huge grins when exiting the track. The last logistical challenge of the Thermal event was a parade lap where all 100-someodd cars got on the track at the same time. 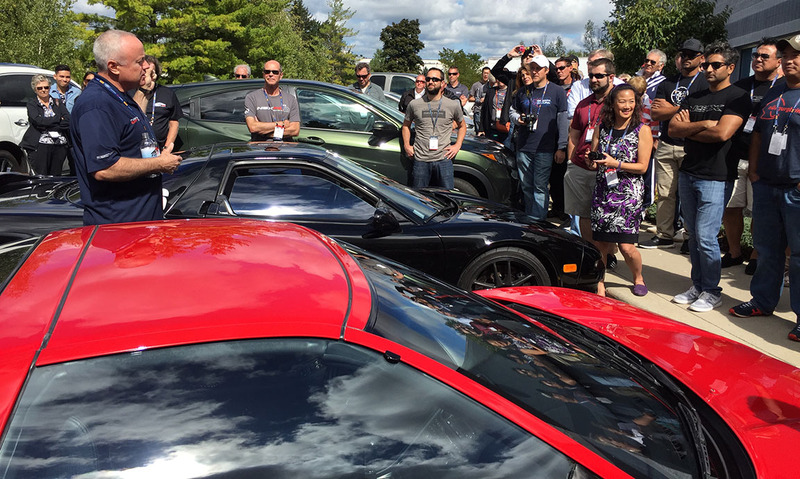 In the lead was the new NSX, followed by Jim Cozzolino and Rahul Chopra, then the mass following of regular attendees. Though speed was low at 15-20 miles per hour max, it was still a surreal feeling to see so many NSXs ahead of, next to me, and behind me. Dinner was held at The Living Desert, a botanical garden and zoo. It was the perfect “under the stars” setting for our club members to meet and great one another in a casual, picnic table setting. 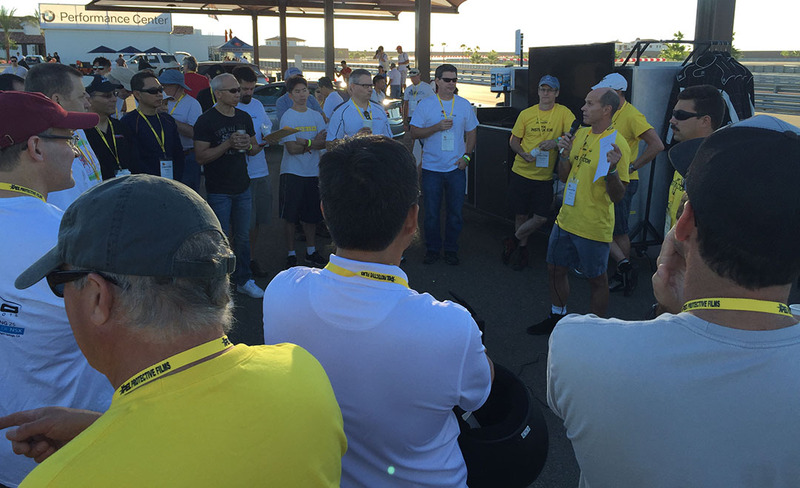 Chris spoke a moment about our sponsors, and then I made a few remarks about tomorrow’s 103-mile group drive to the San Jacinto Mountains. More adventures await! Come back tomorrow for the finale! Here are the rest of today’s shots. Notice the clock in here: 4:47 a.m. and headed to the track. Yawn! 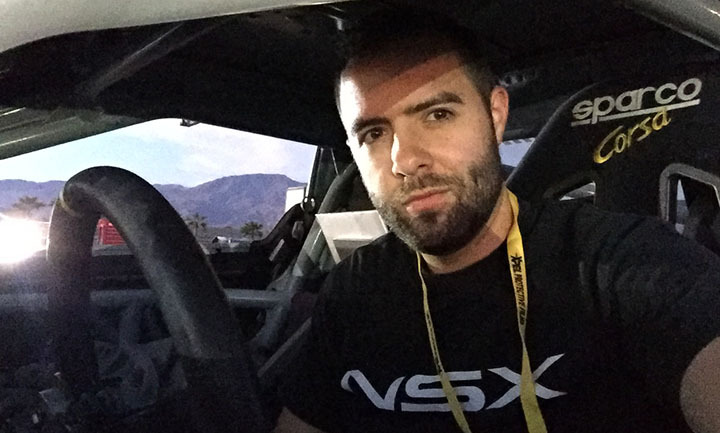 Having a seat in the RealTime Racing NSX when we had to move it forward. Pushed, not started! Driver meeting kick-off at 7:30 a.m.
Mountain views that never get old! D’oh! Had to lay off the pics for a bit! 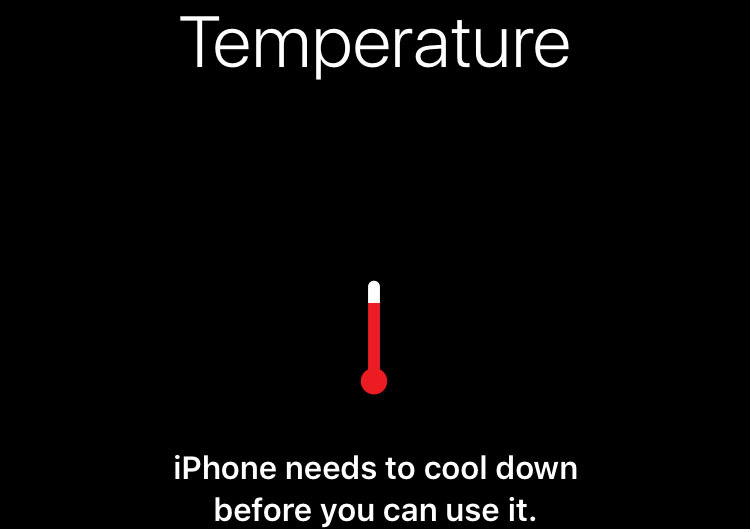 It got toasty out there. Back at the hotel parking garage. Nice try, Camry. Parking at dinner. One of these things is not like the others! You are currently browsing the archives for the NSXPO category.